Early mouse development is accompanied by dynamic changes in chromatin modifications, including G9a-mediated histone H3 lysine 9 dimethylation (H3K9me2), which is essential for embryonic development. Here we show that genome-wide accumulation of H3K9me2 is crucial for postimplantation development, and coincides with redistribution of enhancer of zeste homolog 2 (EZH2)-dependent histone H3 lysine 27 trimethylation (H3K27me3). Loss of G9a or EZH2 results in upregulation of distinct gene sets involved in cell cycle regulation, germline development and embryogenesis. Notably, the H3K9me2 modification extends to active enhancer elements where it promotes developmentally-linked gene silencing and directly marks promoters and gene bodies. 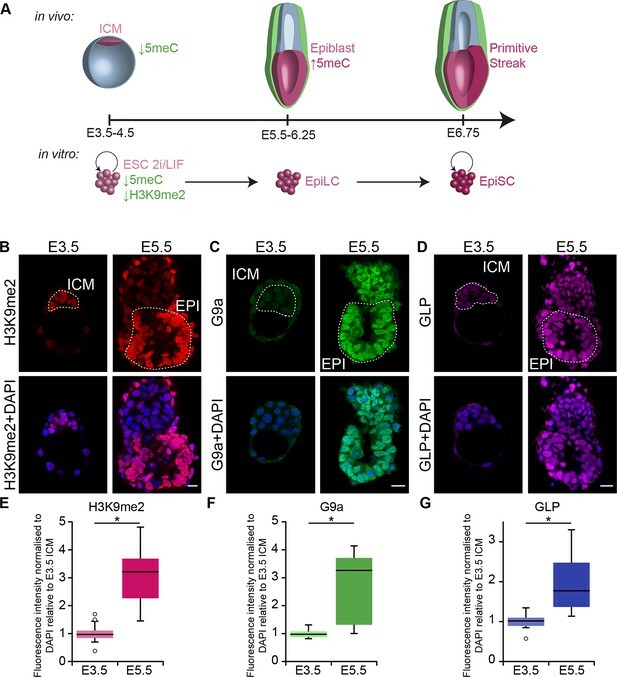 This epigenetic mechanism is important for priming gene regulatory networks for critical cell fate decisions in rapidly proliferating postimplantation epiblast cells. The genome contains full instructions for the development of the whole organism. The genes within the genome encode for all the proteins, but specific genes are selected to be active at the appropriate time. For this reason, there are mechanisms that can turn the genes on and off as and when required. One such mechanism is called methylation, in which a chemical group called a methyl tag is added to either the DNA or to histone proteins. DNA wraps around histone proteins to form a structure called chromatin. When histones are tagged with a methyl group, they become closely packed, and the resulting compaction of the chromatin around a gene inactivates that gene. For gene activation, the methyl tag is replaced by another tag called acetyl, which allows the chromatin to de-compact and become more accessible. Soon after fertilisation, most of the methyl tags an embryo inherits from its parents are removed and a group of stem cells is established. An opposite process takes place once the embryo “nests” in the uterus. Two enzymes called G9a and EZH2 add methyl tags to specific residues on specific histones to regulate the expression of genes at the time when cells begin to decide what tissue to become. Zylicz et al. have now investigated how these enzymes contribute to the changes in chromatin packing that occur during early mouse development that is essential for the progression of normal development. In mouse embryos that lacked the G9a enzyme, Zylicz et al. found that specific genes were inappropriately and prematurely activated early in development, including those generally involved in regulating ‘reproduction’ and 'cell death'. Similarly, embryos that lacked the EZH2 enzyme experienced the early and inappropriate activation of a different set of developmentally important genes. In addition, switches called enhancers control gene expression, and Zylicz et al. found that these regulators are also turned off by histone modifications made by the G9a enzyme. Thus, these findings provide important insights on how genes are regulated during a critical period of mouse development, when cells prepare to acquire their specific identities. This should lead to further work on the role of G9a in the hours after fertilisation; that is before the ‘programming’ events described here. Early mammalian development progresses through a series of landmark events that are regulated by transcriptional and epigenetic mechanisms. Accordingly, establishment of the pluripotent inner cell mass (ICM) in E3.5 blastocysts is linked with global DNA hypomethylation (Figure 1A) (Hackett et al., 2013a; Smith et al., 2012; Wang et al., 2014). Subsequent development of the ICM leads to the formation of primed postimplantation epiblast cells by E5.5–6.25, which are poised to initiate lineage-specification. This developmental transition is accompanied by epigenetic programming, including genome-wide de novo DNA methylation, and potentially accumulation of histone H3 lysine 9 dimethylation (H3K9me2) and redistribution of histone H3 lysine 27 trimethylation (H3K27me3) (Figure 1A) (Borgel et al., 2010; Leitch et al., 2013; Marks et al., 2012). Methyltransferase enzymes, G9a (encoded by Ehmt2) and enhancer of zeste homolog 2 (EZH2), respectively, are responsible for the establishment of these chromatin modifications (O'Carroll et al., 2001; Tachibana et al., 2002; 2005). However, the precise contribution of epigenetic programming for setting and regulating the transcriptional circuitry in early development remains to be fully elucidated (Li et al., 1992; O'Carroll et al., 2001; Okano et al., 1999; Tachibana et al., 2002). G9a-dependent programming occurs at implantation. (A) Schematic of early mouse development and their in vitro equivalents. Genome-wide DNA demethylation after fertilisation leads to an epigenetic basal state with low 5meC in ICM of blastocysts. Shortly after implantation, the epiblast cells undergo epigenetic programming, which includes de novo DNA methylation. By E6.25, the epiblast is primed for somatic development, while being competent for germline specification. Gastrulation follows at E6.75. Naïve ESCs, primed EpiLCs and EpiSCs represent different stages of in vivo development. ESCs grown in 2i/LIF medium resemble the ICM, while EpiLCs, induced from ESCs after 48 h in response to FGF2 and Activin A, are equivalent to epiblast. Their prolonged culture results in EpiSCs, which are reminiscent of the anterior primitive streak (Kojima et al., 2014). (B–D) Whole-mount IF staining for H3K9me2 (B), G9a (C) and GLP (D) in E3.5 and E5.5 embryos. Dotted line shows the ICM, and the EPI. It is noteworthy that a single confocal plane is shown to maintain original IF intensity. For anti-G9a staining of E5.5 embryo, visceral endoderm was removed to reduce the background signal (scale bar = 20 μm). (E–G) Box plots showing IF signal quantification for H3K9me2 (E), G9a (F) and GLP (G). Data shows IF intensity normaliseormalized to DAPI for individual ICM or epiblast cells. At least 3 embryos and 20 cells were quantified for each time point. (*p<0.05 in Wilcoxon rank sum test). DAPI: 4',6-diamidino-2-phenylindole; EPI: epiblast; EpiLCs: epiblast-like cells; ESCs: embryonic stem cells; FGF2: fibroblast growth factor 2; GLP: G9a-like protein; ICM: inner cell mass; IF: immunofluorescence; 2i/LIF: two-inhibitor/leukemia inhibitory factor. The involvement of specific enhancer elements in these events is of particular interest as they undergo rapid epigenetic setting, for example, by becoming activated or poised with histone H3 lysine 27 acetylation (H3K27ac) and H3K27me3 modifications, respectively (Creyghton et al., 2010; Heintzman et al., 2009; Nord et al., 2013; Rada-Iglesias et al., 2011; Zentner et al., 2011). Similarly, the transition from naïve embryonic stem cells (ESCs) to epiblast-like cells (EpiLCs) and epiblast stem cells (EpiSCs) is accompanied by rapid changes in enhancer usage (Buecker et al., 2014; Factor et al., 2014). These in vitro states are equivalent to the ICM, E6.25 epiblast and the primitive streak, respectively (Figure 1A) (Boroviak et al., 2014; Hayashi et al., 2011; Kojima et al., 2014). Similar events likely occur in postimplantation epiblast in vivo when cell cycle shortening is linked with extensive transcriptional and epigenetic alterations, in preparation for key cell fate decisions, including specification of somatic and germline fates (Borgel et al., 2010; Snow and Bennett, 1978). The modifications of enhancers in this context may be of crucial importance for ensuring appropriate response to the ongoing developmental cues. In this study, we have focused on the contribution of G9a-mediated H3K9me2 and EZH2-dependent H3K27me3 to early mouse development. We found that during the formation of postimplantation epiblast, there is a dramatic increase in H3K9me2 levels and a concomitant H3K27me3 redistribution. These events are necessary for repression of a distinct set of genes, including regulators of the germline, cell cycle, apoptosis, and development. The rapid acquisition of H3K9me2 extends to key enhancer elements, thereby reinforcing their repression. We propose that such epigenetic programming of epiblast primes a specific gene regulatory network, which is a necessary prerequisite for embryogenesis. First, we investigated the dynamics of epigenetic programming of repressive H3K9me2 during early mouse development. Immunofluorescence (IF) analysis of E3.5 and E5.5 embryos revealed significant enrichment of H3K9me2 in the epiblast of postimplantation embryos (Figure 1B,E). Accumulation of this modification, which is dependent on G9a and its binding partner G9a-like protein (GLP), coincides with increased levels of the enzymes (Figure 1C,D,F,G). To address the function of H3K9me2, we examined the consequences of Ehmt2 deletion (Ehmt2−/−). Loss of G9a by E6.5 resulted in reduced levels of H3K9me2 modification, and an increase in apoptotic and non-proliferative cells as judged by IF staining for cleaved Caspase 3 and Ki67, respectively (Figure 2—figure supplement 1A,C,D). These changes led to a developmental delay of mutant embryos by E7.5 (Figure 2A,B), consistent with previous reports (Tachibana et al., 2002; Yamamizu et al., 2012). G9a represses germline and proliferation-related genes in the postimplantation epiblast. (A,B) bright-field images of Ehmt2+/+and Ehmt2−/− embryos at E7.5 (A) (scale bar = 0.1 mm). At least nine embryos of each type were staged (B) (*Chi2 test p-value= <0.05). (C) Scatter plot showing transcript expression levels in Ehmt2+/+or +/− and Ehmt2−/− E6.25 epiblast. Blue points are differentially expressed genes (Log2RPKM>1, p-value<0.05, Log2(FC)>1.4). Shown is the geometric average from four biological replicates. (D) Heatmap showing expression of selected genes from enriched GO categories. (E,F) Single-cell RT-qPCR validation of RNA-seq performed on individual epiblast cells isolated from E6.25 Ehmt2+/+ or Ehmt2−/− embryos (minimum 2 embryos and 14 cells). Dot plots show levels of Ehmt2, pluripotency (Nanog, Pou5f1), germline (Asz1, Rhox5, Sohlh2) and proliferation regulators (Cdkn1a, Cd3e, Foxj1). Expression is normalised to Arbp and relative to average in Ehmt2−/− and for Ehmt2 relative to Ehmt2+/+. Statistical significance was calculated using Wilcoxon rank sum test for Pou5f1 and Nanog, where majority of WT and KO cells show detectable expression. For remaining genes a Chi2 test was used. (*p-value<0.05). Also see Figure 2—source data 1–4 and Figure 2—figure supplement 1–3. LHF: late head fold; EHF: early head fold; LB: late allantoic bud; OB: no allantoic bud; LS: late streak; PS: pre-streak. RT-qPCR: real-time quantitative polymerase chain reaction; RNA-seq: RNA sequencing; WT: wild-type: KO: knockout; GO: gene ontology; FC: fold change. To gain further insight into the underlying causes of the phenotype, we performed RNA sequencing (RNA-seq) on individual Ehmt2−/− epiblasts at E6.25. This revealed misregulation of 180 genes, of which 147 (~82%) are upregulated (Figure 2C, Figure 2—source data 1) (Log2[fold change[FC]]>1.4, p-value<0.05). Among the upregulated genes, ~27% of them were located on the X chromosome (p-value=1.6 × 10-15), notably in clusters of Xlr, Rhox and Mage-a genes. Consistent with the known functions of these clusters, we found significant enrichment of gene ontology (GO) terms linked to hematopoiesis, sexual reproduction, and regulation cell proliferation (Figure 2D, Figure 2—figure supplement 1B, Figure 2—source data 2). To validate these findings, we analysed individual E6.25 epiblast cells by single cell real-time quantitative polymerase chain reaction (RT-qPCR). A significant proportion of Ehmt2−/−cells showed upregulation of the cyclin-dependent kinase inhibitor Cdnkn1a, and late germline markers Asz1 and Rhox5 but not Pou5f1 (coding for OCT4) or Nanog (Figure 2E,F, Figure 2—figure supplement 2A,B). This indicates that, contrary to a previous report (Yamamizu et al., 2012), the phenotypic effects cannot be attributed to a delayed exit from naïve pluripotency. Furthermore, loss of G9a did not abrogate the establishment of a population of primordial germ cells (PGCs), as judged by the expression of AP2γ and OCT4, key germline regulators (Figure 2—figure supplement 2C,D). These observations show that G9a promotes growth of the embryo by repressing apoptotic and late germline genes, but it does not affect the exit from naïve pluripotency and establishment of the PGC lineage. Next, we examined the consequences of loss of Ezh2 and thus of the H3K27me3 modification, which likely undergoes significant redistribution during epiblast development (Marks et al., 2012). For this reason, we performed RNA-seq on individual E6.25 epiblasts lacking EZH2 (Ezh2−/−). We found upregulation of 165, and downregulation of 24 transcripts (Log2(FC)>1.4, p-value<0.05) (Figure 2—figure supplement 3A,B, Figure 2—source data 3), among which were homeobox and gastrulation-related genes, including Hoxd13 and Lefty2, but pluripotency regulators such as Nanog and Pou5f1 were not affected (Figure 2—figure supplement 3B,C, Figure 2—source data 4). Importantly, we only found five significantly upregulated genes that were shared between Ehmt2−/− and Ezh2−/− embryos. Thus, G9a and EZH2 appear to stabilise silencing of distinct sets of germline, proliferation and developmental regulators, but neither of them has an effect on the pluripotency transcription programme in postimplantation embryos. To understand the roles of H3K9me2 and H3K27me3 modifications during the transition from naïve pluripotency in the ICM of blastocysts to a primed pluripotent state in postimplantation embryos, we investigated the genome-wide distribution of these modifications. For this purpose, we optimised a low cell number chromatin immunoprecipitation with sequencing (lcChIP-seq) protocol to analyse ~25,000 pregastrulation E6.25 epiblast cells in two biological replicates (Figure 3—figure supplement 1A–C)(Ng, et al., 2013). We intersected this information with our RNA-seq data and with the published whole genome bisulfite sequencing (WGBSeq) datasets (Seisenberger et al., 2012). This enabled us to generate a comprehensive overview of the epigenetic and transcriptional state of primed pluripotent epiblast cells in vivo. The enrichment of H3K9me2 and H3K27me3 modifications in E6.25 epiblast is associated with low and high CpG content, respectively (Figure 3—figure supplement 2A). This is also the case in ESCs cultured in conventional media with serum (sESC) (Lienert et al., 2011; Wen et al., 2009). By contrast, naïve ESCs grown in 2i/LIF (2i/LIF ESCs) show spreading of H3K27me3 outside the CpG dense loci (Marks et al., 2012). Thus, there is redistribution of H3K27me3 in E6.25 epiblast, relative to both naïve ESCs and possibly ICM in vivo. The association of H3K9me2 and H3K27me3 modifications on promoters is mutually exclusive, since only 0.3% of them are enriched for both marks (Figure 3A, anticorrelation with Chi2 p-value=0.0024). These differences are in line with H3K9me2 and H3K27me3 being linked to high and low 5-methylcytosine (5meC) levels, respectively (Figure 3—figure supplement 2B). Nonetheless, despite marking distinct chromatin regions, both H3K9me2 and H3K27me3 are linked to transcriptional repression (Figure 3B). Notably, this gene repression is correlated with histone modification enrichment at promoters as well as in gene bodies. The H3K9me2 modification in gene bodies could impede transcriptional elongation, splicing, or activity of regulatory elements (Allo et al., 2009). Our evidence suggests that H3K9me2 and H3K27me3 modifications in vivo are linked to distinct repressive chromatin states. We confirmed this by means of self-organizing maps, which cluster promoters and gene bodies based on similarity of their cumulative epigenetic signature with respect to transcriptional activity (Figure 3C)(Wehrens and Buydens, 2007). In vivo lcChip-seq from E6.25 epiblast reveals distinct epigenetic state of primed pluripotent cells. (A) Density contour plot showing the relationship between H3K9me2 and H3K27me3 enrichment. Shown are all promoters associated with genes repressed in the epiblast. (B) Density contour plots showing correlation between H3K9me2 (blue) and H3K27me3 (red) at promoters (left panels) and gene bodies (right panels), with transcriptional activity in epiblast. 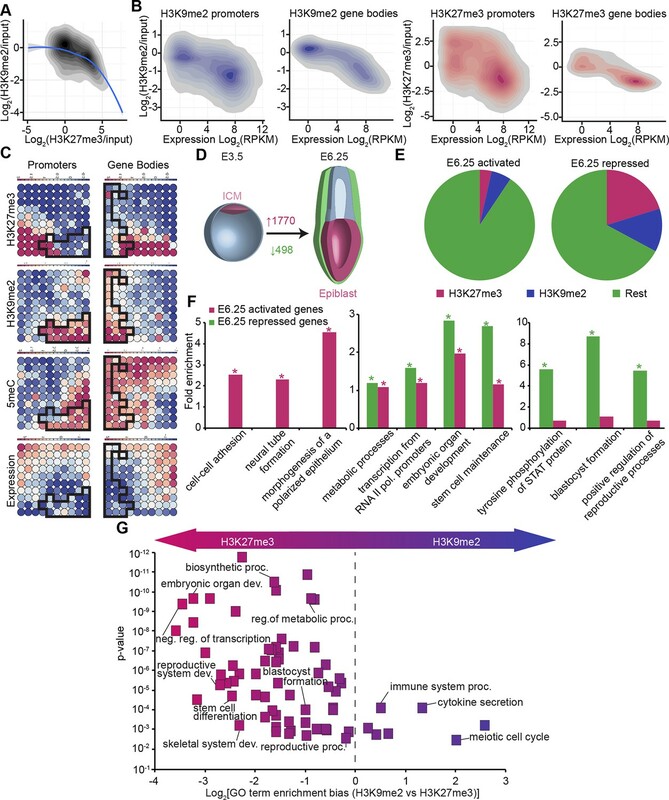 (C) Unbiased clustering of promoters (left panels) and gene bodies (right panels) based on their cumulative epigenetic and transcriptional signature in epiblast. Analysis was performed using self-organizing maps. Each circle on the map represents a set of regions with very similar modification and expression profiles; neighbouring circles on the map are also similar. 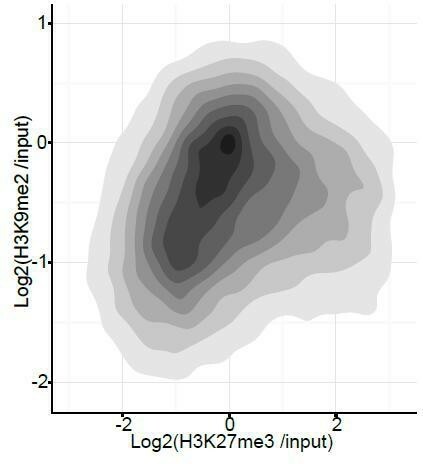 Black line separates H3K9me2-enriched regions. Scale is in relative enrichment calculated by centring input-normalised RPKM (for ChIP), expression and DNA methylation and dividing by standard deviation. (D) Schematic of early mouse development showing numbers of genes becoming activated (red) and repressed (green) in E6.25 when compared with E3.5 ICM (Log2(RPKM)<4, p-value<0.05, Log2(FC) >1). (E) Pie charts showing proportion of genes repressed or activated in E6.25 with enrichment of H3K9me2 or H3K27me3 at promoter and/or gene body. 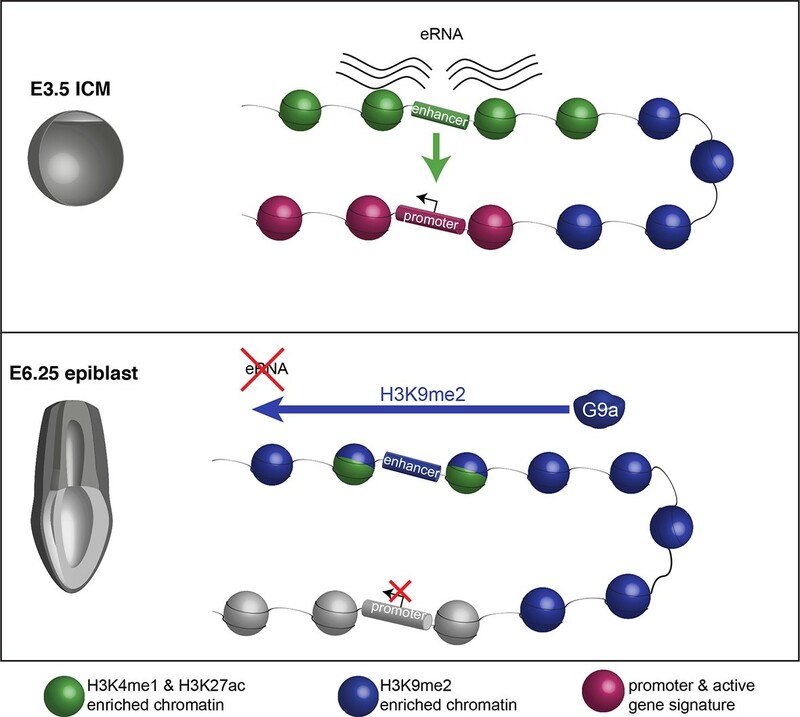 Histone modification enrichment was classified using k-means. (F) Bar plots show fold enrichment of selected GO terms in genes repressed and activated in E6.25 epiblast compared with E3.5 ICM. * p-value<0.05 using Fisher test. (G) GO term enrichment analysis of genes repressed in E6.25 epiblast when compared with E3.5 ICM in relation to their histone methylation status. X axis shows the GO term enrichment bias between H3K9me2- and H3K27me3-marked genes (GO term fold enrichment in H3K9me2 marked genes vs. that in H3K27me3 enriched ones). Y axis is minimum Fisher p-value in the H3K9me2- or H3K27me3-marked genes. Complexity of enriched GO terms was reduced by removing terms with highly overlapping gene sets. Also see Figure 3—figure supplement 1–3. lcChIP-seq: low cell number chromatin immunoprecipitation with sequencing; H3K9me2: histone H3 lysine 9 dimethylation; H3K27me3: histone H3 lysine 27 trimethylation; RPKM: Reads Per Kilobase of transcript per Million mapped reads; FC: fold change; ICM: inner cell mass; GO: gene ontology. To gain insight into the epigenetic regulation of developmental progression from naïve to primed pluripotent cells in vivo, we integrated our dataset from E6.25 epiblasts with RNA-seq of E3.5 ICM (ERP005749) (Boroviak et al., 2014). First, we identified genes that become robustly activated or repressed in E6.25 epiblasts relative to ICM (Figure 3D) (Log2(RPKM)<4, p-value<0.05, Log2(FC)>1). These genes generally corresponded to the expected developmental progression. For example, the transcripts that become silenced by the postimplantation stage (E6.25) are enriched for GO terms such as ‘blastocyst formation’ and ‘STAT (Signal Transducer and Activator of Transcription) signalling regulation’ (Figure 3F). These repressed genes are generally enriched for H3K9me2 or H3K27me3, especially when they have high or intermediate CpG density, respectively (Figure 3E, Figure 3—figure supplement 3A). Moreover, consistent with global DNA hypomethylation of the ICM, there is transient expression of 5meC-sensitive germline genes at E3.5 that are subsequently repressed by E6.25. On the other hand, genes activated in E6.25 epiblast include ‘neural tube’ and ‘polarized epithelium’ genes (Figure 3F). Finally, both activated and repressed genes are enriched for regulators of transcription, embryonic development and metabolic processes (Figure 3F). This analysis reveals that the transcriptional changes between the naïve state associated with the ICM, and the primed state of postimplantation epiblast in vivo reflect the dramatic alterations in signalling, morphology, and metabolism occurring during development. Next, we focused on genes that are repressed upon implantation and accumulate H3K9me2 or H3K27me3. GO term analysis revealed preferential acquisition of H3K27me3 on genes associated with transcriptional regulation, embryonic organ development, blastocyst formation, and metabolism (Figure 3G). On the other hand, meiotic genes and those involved in immune responses were more likely targeted by H3K9me2. This analysis reveals that different functional pathways are inactivated via establishment of distinct epigenetic states. Despite being derived from postimplantation embryos, EpiSCs have reduced competence for the germline fate (Hayashi and Surani, 2009). To investigate this, we directly compared the epigenetic states of E6.25 epiblast and EpiSCs. 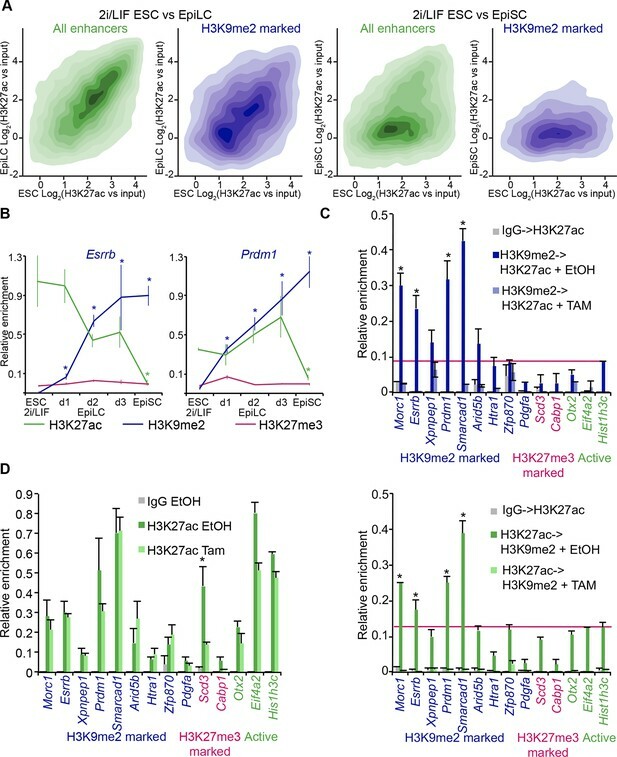 Global and metagene analysis revealed little differences in the distribution of H3K9me2 and H3K27me3 between E6.25 epiblast and EpiSCs (Figure 4A,D, Figure 4—figure supplement 1A). Similarly, over 97% of genes marked by H3K9me2 showed enrichment in both cell types (Figure 4B,C). On the other hand, H3K27me3 underwent a significant rearrangement in EpiSCs when compared with in vivo epiblast cells, with genes regulating meiosis and bone development preferentially losing H3K27me3 at promoters (Figure 4E,F,H). We reasoned that this might be associated with DNA hypermethylation of such elements since H3K27me3 mark is anti-correlated with 5meC (Figure 3—figure supplement 2B). Indeed, our whole genome bisulfite sequencing (WGBSeq) of EpiSCs revealed a ~10% increase in global DNA methylation levels (Figure 4G). More specifically, promoters that had lost H3K27me3 acquired significantly more 5meC in EpiSCs (Figure 4—figure supplement 1B). This observation indicates that EpiSC derivation leads to an aberrant epigenetic state, especially at germline promoters. Such stable silencing of these genes might contribute to a reduced competence of EpiSC for PGC fate. EpiSC show aberrant H3K27me3 distribution and DNA hypermethylation at germline genes. (A,D) Distribution of H3K9me2 (A) and H3K27me3 (D) by metagene analysis in epiblast and EpiSCs. Genes were classified based on promoter CpG density. (Scale = base pairs.) (B,E) Scatter plots showing H3K9me2 (C) and H3K27me3 (D) enrichment at gene bodies and promoters, respectively, in EpiSC versus E6.25 epiblast. Regions were classified as marked in both samples (purple), epiblast (pink) or EpiSC only (blue). Classification was performed using k-means and EdgeR (pval<0.05, Log2(FC)>2). (C,F) Venn diagrams showing overlap of H3K9me2 (E) or H3K27me3 (F) enrichment between EpiSC and E6.25 epiblast. (G) Box plot showing global DNA methylation levels from WGBSeq in E6.5 epiblast and EpiSC. ***p-value<0.001 from Wilcoxon rank sum test. (H) Bar plot showing top 10 enriched GO terms in genes uniquely marked by H3K27me3 in the E6.25 epiblast. Also see Figure 4—figure supplement 1. HCP: high CpG density; ICP: intermediate CpG density; LCP: low CpG density; TSS: transcriptional start site; TTS: transcriptional termination site; EpiSCs: epiblast stem cells; H3K27me3: histone H3 lysine 27 trimethylation; H3K9me2: histone H3 lysine 9 dimethylation; FC: fold change; GO: gene ontology; WGBSeq: whole genome bisulfite sequencing. Next, we integrated our results on the transcriptional and epigenetic state of epiblast cells from embryos in vivo to identify genes under direct epigenetic regulation by G9a and EZH2. We found that >97% of genes enriched with either H3K9me2 or H3K27me3 modifications do not exhibit differential expression in the Ehmt2−/− and Ezh2−/− embryos (Figure 5A). This is consistent with only a minority of Polycomb Repressive Complex 2 (PRC2) targets being dependent on H3K27me3 for their repression in naïve ESCs (Riising et al., 2014). Thus, the epigenetic programming of epiblast cells by G9a and EZH2 appears to directly regulate silencing at only a limited set of genes, possibly owing to redundant epigenetic mechanisms. Nevertheless, we found that ~63% of genes upregulated in Ezh2−/− and ~36% in Ehmt2−/− show enrichment for H3K27me3 and H3K9me2, respectively (Figure 5A, Figure 5—figure supplement 1A, Figure 5—source data 1,2). In the case of Ehmt2−/−, a larger proportion (~53%) of genes seem to be regulated by H3K9me2 deposition at the gene bodies (Figure 5A). Among direct G9a targets in the epiblast are Asz1, Casp14 and Cdkn1a, but not Otx2, or polycomb targets such as Hoxc10 (Figure 5B). These overlaps are significantly higher than the 10% previously observed when analysing Suz12 knockout (KO) sESC, which self-renew without PRC2 and accumulate secondary transcriptional alterations (Pasini et al., 2007). Thus, by focusing on in vivo epiblast just prior to the onset of an overt phenotype, we were able to identify direct primary targets of both G9a and EZH2. H3K9me2 and H3K27me3 are directly involved in repression of genes and transposable elements. (A) Venn diagrams showing overlap between H3K27me3 enrichment at promoters (left panel) or H3K9me2 at gene bodies (right panel); genes upregulated in Ezh2−/− and Ehmt2−/− epiblasts are shown. The overlaps are statistically significant (p-value< 0.01 using Chi2 test). (B) Genome browser tracks showing H3K9me2 and H3K27me3 enrichment at genes that are: derepressed in Ehmt2−/− (Asz1, Casp14, Cdkn1a), active epiblast markers (Otx2), and PRC2 targets (Hoxc10). Data is shown as a sliding window (1kb and 300bp for H3K9me2 and H3K27me3, respectively) of enrichment over input: Log2(RPM ChIP/RPM Input). (C) lcChIP-qPCR validation for H3K9me2 and H3K27me3 at the promoter of Asz1 and gene body of Cdkn1a during EpiLC and EpiSC induction. Signal was scaled relative to average enrichment on negative (Gapdh: H3K9me2 and H3K27me3) and positive control regions (Pcsk5: H3K9me2, Hoxc10: H3K27me3). Data are represented as mean (± SEM) from three independent biological replicates (*Student’s t-test p-value<0.05 relative to 2i/LIF ESC sample). (D) Scatter plot showing correlation between the number of unique repeat loci in each subfamily with the number of loci upregulated in Ehmt2−/− E6.25 epiblast. Red points are subfamilies with significant H3K9me2 enrichment and increased proportion of upregulated loci. (E) Single cell RT-qPCR validation of repeat upregulation in individual E6.25 Ehmt2+/+ and Ehmt2−/−epiblast cells. Statistical significance was calculated using Wilcoxon rank sum test for IAP where the majority of WT and KO cells show detectable expression. For remaining repeats, a Chi2 test was used.(*p-value<0.05). (F) LcChIP-qPCR measuring H3K9me2 levels at selected repeat elements in Ehmt2F/− CreER+ve d2 EpiLCs treated with EtOH or TAM. Data are mean (± SD) from two independent biological replicates. (*Student’s t-test p-value<0.05 of EtOH compared with TAM treated sample). Also see Figure 5—figure supplement 1,2 and Figure 5—source data 1,2. H3K9me2: histone H3 lysine 9 dimethylation; H3K27me3: histone H3 lysine 27 trimethylation; EZH2: Enhancer of zeste homolog 2; ChIP: chromatin immunoprecipitation; EpiLCs: epiblast-like cells; EpiSCs: epiblast stem cells; SEM: standard error of the mean; TAM: tamoxifen; EtOH: ethanol; IAP: intracisternal A particle. Due to very limited material, we confirmed our genome-wide analysis of epiblast by using a more tractable in vitro model of priming cells for gastrulation. The in vivo developmental progression is represented in vitro by 2i/LIF ESCs, which are equivalent to ICM, followed by primed EpiLCs and EpiSCs, which represent postimplantation epiblast and the primitive streak, respectively (Figure 1A) (Hayashi et al., 2011; Kojima et al., 2014). The lcChIP-qPCR analysis showed rapid increase in H3K9me2 levels in primed cells at direct targets of G9a, including Asz1 promoter and Cdkn1a gene body (Figure 5C), as well as promoters of other germline and proliferation regulators (Figure 5—figure supplement 1B). Thus, our genome-wide dataset together with the analysis of single loci reveal that G9a represses regulators of germline and cell proliferation, and a subset of them accumulate H3K9me2 mark shortly after implantation. We next investigated the role of G9a in regulating transposable elements (TEs) as previous studies have shown that loss of G9a in sESC leads to aberrant expression of murine endogenous retroviruses with leucine tRNA primer (MERV-L) (Maksakova et al., 2013). To this end, we combined our lcChIP-seq and RNA-seq from E6.25 epiblast and mapped only unique reads to all mouse repeat loci with sufficient coverage. We found that ~15% (4.8 × 105/3.3 × 106) and ~18% (4.8 × 105/2.6 × 106) of repeats show significant H3K9me2 and H3K27me3 enrichment, respectively (Figure 5—figure supplement 2A). On the other hand, only ~0.11% (3636/3.3 × 106) and ~0.06% (1646/2.6 × 106) of all repeats were significantly upregulated in Ehmt2−/− and Ezh2−/− epiblast, respectively. By intersecting fractions of upregulated and epigenetically marked loci in each subfamily, we identified repeats that are enriched for and regulated by H3K9me2 or H3K27me3 (Figure 5D, Figure 5—figure supplement 2B–F). Direct targets for EZH2 are limited and exhibited no subfamily trend. However, 13/15 subfamilies repressed by G9a are notable as they correspond to endogenous retroviral elements (ERV), especially ERV-L and ERV-LMaLR (Figure 5—figure supplement 2C). Consistent with the RNA-seq analysis, single cell RT-qPCR from individual E6.25 Ehmt2+/+ or Ehmt2−/− epiblast cells showed upregulation of mouse transposon D (MTD), mouse transposable element b (MTEb ) and Lx8 but not of IAP repeat elements (Figure 5E). To confirm G9a-dependent deposition of H3K9me2 at these transposons, we used an in vitro model. We generated two Ehmt2F/− ESC lines expressing a tamoxifen (TAM)-inducible Cre recombinase (CreER), which were cultured in 2i/LIF medium. Following TAM treatment, day 2 EpiLCs were used for lcChIP-qPCR, which showed significant depletion of H3K9me2 upon loss of G9a at MTEb and Lx8 loci, but not IAP (Figure 5F). Thus, G9a deposits H3K9me2 at some repeat elements in postimplantation epiblast, where it is necessary to repress TEs that predominantly belong to the ERVs class. This implies a potentially important role for G9a in maintaining genomic integrity. H3K9me2 modification, unlike H3K27me3, accumulates rapidly in the postimplantation epiblast (Figure 1B), preferentially in the intergenic regions where many cis regulatory elements reside (Figure 4—figure supplement 1A). Visual inspection of our lcChIP-seq analysis revealed that multiple putative enhancers show H3K9me2 enrichment in the epiblast, for example, in close proximity to Esrrb and Prdm1 (Figure 6A), but the role of this modification at such elements is thus far unknown. H3K9me2 marks enhancers undergoing inactivation during exit from naïve pluripotency. (A) Genome browser tracks showing p300, H3K27ac, and H3K4me1 at inactive Esrrb and Prdm1 putative enhancers (black boxes) in day 2 EpiLCs (GSE56138) (Buecker et al., 2014). Bottom two tracks show H3K27me3 (red) and H3K9me2 (blue) enrichment in the E6.25 epiblast. Green and grey tracks show read density, while blue and red tracks show Log2 enrichment of ChIP sample over the input sample. (B) Heatmaps showing H3K9me2 and H3K27ac enrichment at enhancers active in ESCs grown in 2i/LIF. All ESC enhancers in 2i/LIF enriched for p300, H3K27ac and H3K4me1 were clustered using kohonen package based on H3K9me2 and H3K27ac. Individual classes were ranked based on H3K9me2 levels in EpiLCs. H3K27ac tracks were extracted from (GSE56138, GSE57409) (Buecker et al., 2014; Factor et al., 2014). (C) LcChIP-qPCR measuring H3K9me2 levels at putative enhancer elements in Ehmt2F/−CreER+ve d2 EpiLCs treated with EtOH or TAM. H3K9me2- (blue), H3K27me3- (red) marked, as well as active (green) regulatory elements are shown. Data are mean (± SD) from two independent biological replicates. (*Student’s t-test p-value<0.05 of EtOH compared with TAM treated sample). Also see Figure 6—figure supplement 1,2. H3K27ac: histone H3 lysine 27 acetylation; EpiLCs: epiblast-like cells; H3K27me3: histone H3 lysine 27 trimethylation; ChIP: chromatin immunoprecipitation; H3K9me2: histone H3 lysine 9 dimethylation; lcChIP-seq: low cell number chromatin immunoprecipitation with sequencing; TAM: tamoxifen; EtOH: ethanol; SD: standard deviation; ESCs: Embryonic stem cells. To examine likely functions of H3K9me2 at enhancers, we turned to the in vitro model of ESC priming towards EpiLCs and EpiSCs. We generated high quality native ChIP-seq datasets for H3K27me3 and H3K9me2 from 2i/LIF ESCs, EpiLCs and EpiSCs. Enhancers in these pluripotent cells have recently been identified based on enrichment of p300, H3K4me1 and H3K27ac (GSE56138, GSE57409) (Buecker et al., 2014; Factor et al., 2014). Consistent with programming of epiblast in vivo by H3K9me2 modification (Figure 1B), we found genome-wide accumulation of H3K9me2 in primed pluripotent cells (Figure 6—figure supplement 1A). As H3K9me2 ChIP-seq measures only the relative enrichment, we have scaled it to indicate absolute quantities of histone modification. Our analysis revealed increased enrichment of H3K9me2 at genes upon exit from naïve pluripotency (Figure 6—figure supplement 1B). This effect extends to many enhancers but significant H3K9me2 enrichment is observed at elements, which show DNA hypermethylation and cluster separately from poised H3K27me3-enriched elements (Figure 6—figure supplement 1D,E, Figure 6—figure supplement 2A,B). As with H3K27me3 modification, H3K9me2 is not a distinct enhancer mark, but rather is associated with larger domains within which regulatory elements reside (Figure 6—figure supplement 2C). Interestingly, of all the enhancers that are active in 2i/LIF ESCs (p300, H3K4me1 and H3K27ac enrichment), ~12% (3884) gain H3K9me2 after 2 days of induction towards EpiLCs (Figure 6B), while only 3% (1117) become enriched for H3K27me3. Such elements are also enriched for H3K9me2 in E6.25 epiblast (Figure 6B). To validate these findings, we performed lcChIP-qPCR from ethanol or TAM treated Ehmt2F/− EpiLCs expressing CreER. We confirmed that previously identified enhancer elements gain H3K9me2 in a G9a-dependent manner but active or H3K27me3 poised elements do not (Figure 6C). Thus, acquisition of H3K9me2 occurs at distal regulatory elements, perhaps to direct or reinforce their inactivation. Notably, H3K9me2-marked enhancers retain partial enrichment of active H3K27ac mark in EpiLCs, but exhibit near-complete H3K27ac loss in EpiSCs (Figure 7A, Figure 6—figure supplement 1C). Consistently, enhancer classification based on their epigenetic state has shown that ~57% (2212) of H3K9me2-enriched enhancers in EpiLCs still retain significant H3K27ac (Figure 7—figure supplement 1), which we further confirmed using lcChIP-qPCR (Figure 7B). To exclude possible effects of cell population heterogeneity, we performed sequential ChIP-qPCR, which showed dual H3K9me2 and H3K27ac enrichment (Figure 7C). Such transient dual marking might indicate their continued responsiveness to signalling cues. In addition, H3K9me2-enriched elements showed no change in the active H3K27ac modification in EpiLCs lacking G9a (Figure 7D). 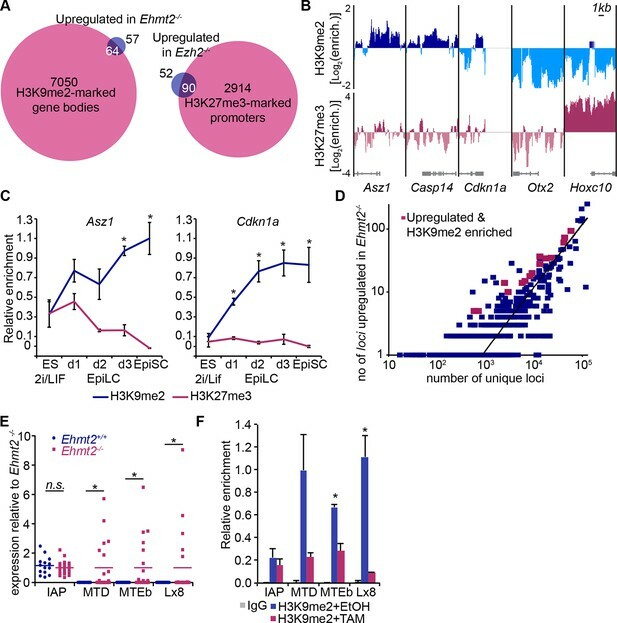 Taken together, our findings show that the repressive H3K9me2 and activating H3K27ac modifications transiently co-occur at enhancers during epiblast priming. H3K9me2 spreading to enhancers results in transient coenrichment with H3K27ac. (A) Density contour plots showing correlation between H3K27ac enrichments at enhancers in 2i/LIF ESCs versus EpiLC (left panels) or 2i/LIF ESCs versus EpiSC (right panels). Green panels show all regulatory elements active in 2i/LIF ESCs (p300, H3K4me2 and H3K27ac enrichment), while blue panels show only the subset that becomes enriched with H3K9me2 in EpiLCs. (B) lcChIP-qPCR results measuring levels of H3K9me2, H3K27me3 and H3K27ac at putative Prdm1 and Esrrb enhancers. Samples were collected during EpiLC and EpiSC induction. Signal was scaled relative to average enrichment on negative (Pcsk5: H3K27ac, Gapdh: H3K9me2 and H3K27me3) and positive control regions (Pcsk5: H3K9me2, Gpr20: H3K27ac, Hoxc10: H3K27me3). Data are represented as mean ( ± SEM) from three independent biological replicates (*Student’s t-test p-value<0.05 relative to 2i/LIF ESC sample). (C) Sequential ChIP-qPCR performed Ehmt2F− CreER+ve d2 EpiLCs treated with EtOH or TAM. Upper panel shows samples precipitated first with anti-H3K9me2 antibody and later H3K27ac. Bottom panel shows results from an inverse experiment. Samples were scaled to a positive (Gpr20) control region. Data are mean (± SD) from two independent biological replicates. (*Student’s t-test p-value<0.05) (D) LcChIP-qPCR measuring enrichment of H3K27ac at selected enhancers in EtOH- or TAM-treated Ehmt2F/− CreER+ve d2 EpiLCs. H3K9me2-marked (blue) and control H3K27me3-poised or active regions are presented. Data are mean (± SD) from two independent biological replicates. (*Student’s t-test p-value<0.05). Also see Figure 7—figure supplement 1. H3K27ac: histone H3 lysine 27 acetylation; 2i/LIF: two-inhibitor/leukemia inhibitory factor; EpiLCs: epiblast-like cells; EpiSCs: epiblast stem cells; lcChIP-seq: low cell number chromatin immunoprecipitation with sequencing; H3K9me2: histone H3 lysine 9 dimethylation; H3K27me3: histone H3 lysine 27 trimethylation; SEM: standard error of the mean; ESCs: Embryonic stem cells; TAM: tamoxifen; EtOH: ethanol; SD: standard deviation. Enrichment of H3K9me2 generally coincides with transcriptional repression in epiblast cells that prompted us to incorporate our RNA-seq and published data from microarray experiments (GSE30056) (Hayashi et al., 2011). 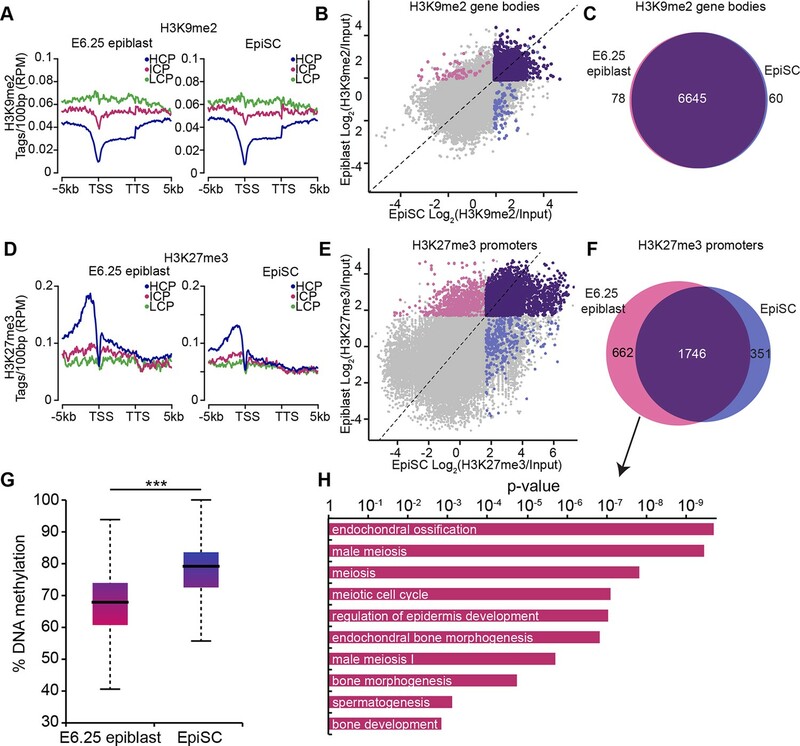 We found that enhancers marked by H3K9me2 are in close proximity to repressed genes, both in the epiblast in vivo and EpiLCs in vitro (Figure 8A,B). Consistent with the Ehmt2−/− embryonic phenotype affecting growth and development, these genes are enriched for the regulators of apoptosis (Figure 8—figure supplement 1A). To further address potential functions of these enhancer elements, we performed de novo motif analysis. 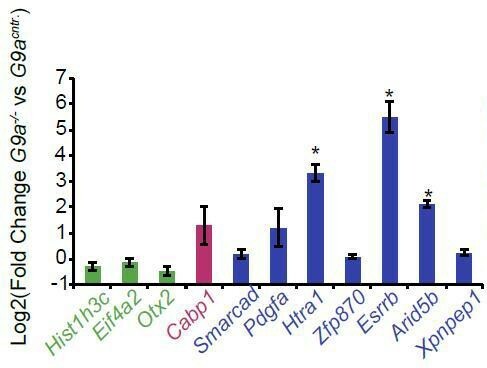 H3K9me2-marked enhancers showed significant enrichment for regulators of early development (T and SOX2) and apoptosis (p53 and p63) (Figure 8—figure supplement 1B). In line with the PRC2 function, H3K27me3 poised enhancers showed enrichment for motifs of skeletal development regulators SOX9 and HOXD8 (Figure 8—figure supplement 1C). Such non-overlapping motif signatures further validate that H3K27me3 and H3K9me2 accumulate at distinct enhancers that regulate early development. G9a promotes transcriptional inactivation of enhancers. (A,B) Box plots showing transcript levels of genes in epiblast (A) and EpiLCs (B), which lie in proximity of H3K9me2- or H3K27me3-marked enhancers. All comparisons are statistically significant (p<0.05). The effect size relative to active set is shown in the graphs: *r≤0.10; **0.10<r≤0.15; ***r>0.15 calculated using Wilcoxon rank sum test. For analysis of EpiLCs, a published microarray experiment was used (GSE30056) (Hayashi et al., 2011). (C,D) RT-qPCR for eRNAs at selected H3K9me2-marked (blue) and control (red: H3K27me3 enriched, green: active) enhancers shown as line plots (D) and summarized in a heatmap (C). Data are represented as mean ( ± SEM) from three independent biological replicates. Samples are normalised to ESC 2i/LIF sample with the exception of Otx2, which is normalised to d3 EpiLCs. (*Student’s t-test p-value<0.05) (E) FC of eRNA expression in Ehmt2F/− CreER+ve d2 EpiLCs treated with TAM relative to EtOH control. Transcripts are originating from H3K9me2- (blue), H3K27me3-marked (red) or active (green) loci. Data are presented as mean (± SEM) from three independent biological replicates. (*Student’s t-test p-value <0.05) (F) FC of eRNA expression in individual Ehmt2−/− E6.25 epiblasts normalised to Ehmt2+/+ littermates. Lines show geometric means. (*p<0.05 Wilcoxon rank sum test). Also see Figure 8—figure supplement 1. EpiLCs: epiblast-like cells; H3K9me2: histone H3 lysine 9 dimethylation; H3K27me3: histone H3 lysine 27 trimethylation; RT-qPCR: real-time quantitative polymerase chain reaction; eRNA: enhancer RNA; ESCs: Embryonic stem cells; TAM: tamoxifen; EtOH: ethanol. Transcriptional analysis of genes most proximate to specific enhancers is subject to errors, since these elements can regulate distant promoters (Sanyal et al., 2012). Therefore, we determined the correlation between H3K9me2 enrichment and enhancer activity by analysing the expression levels of enhancer RNAs (eRNA), which is a hallmark of active enhancers (Kim et al., 2010). We performed RT-qPCR for candidate robustly expressed eRNAs originating from regions enriched for H3K9me2 or H3K27me3. Upon EpiLC induction, such elements underwent robust transcriptional inactivation (Figure 8C,D). 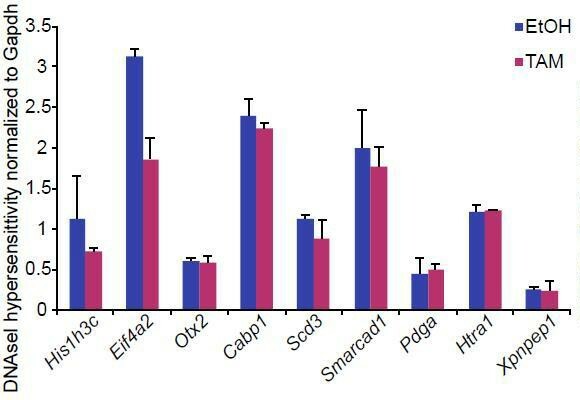 This is not a global effect because enhancers for genes, such as Otx2 that are linked with primed pluripotency, show increased eRNA expression in EpiLCs (Figure 8D). Thus, upon blastocyst implantation, H3K9me2 domains extend to active enhancers targeted for initiation of silencing, which accounts for the co-enrichment with H3K27ac. To determine the functional relevance of H3K9me2 on enhancers, we used two Ehmt2F/− ESC lines expressing CreER. 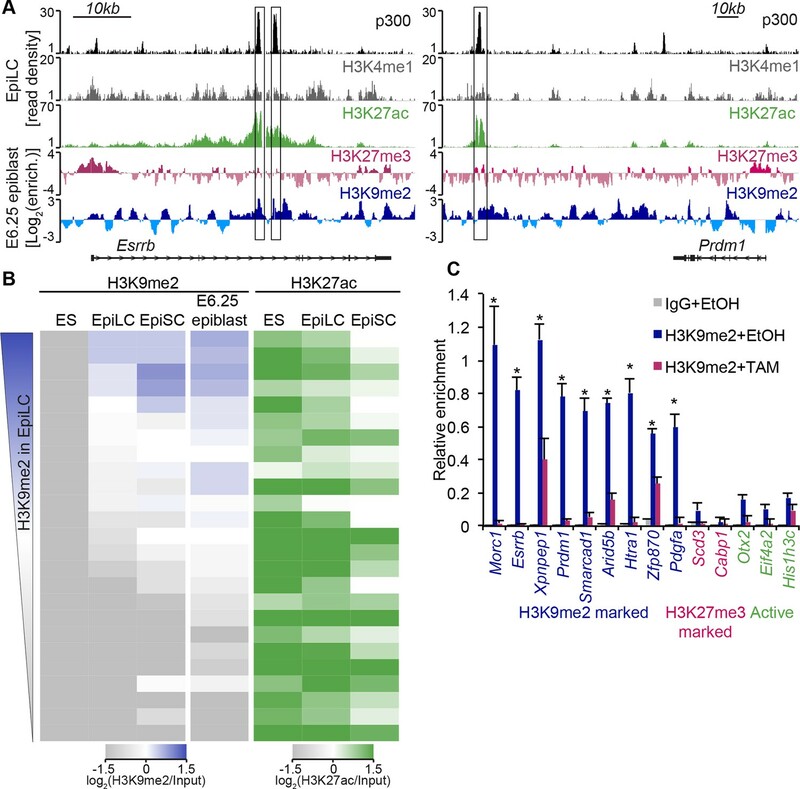 Following TAM treatment, day 2 EpiLCs showed increased eRNA expression at 4 of 8 previously identified H3K9me2-marked enhancers, confirming that, in principle, this histone modification promotes repression of enhancer activity (Figure 8E). This was specific to H3K9me2, since the H3K27me3-enriched and active regulatory elements were unaffected (Figure 8E). Finally, we sought to validate our findings in vivo since multiple enhancer elements showed increased levels of H3K9me2 in the post-implantation epiblast. To this end, we isolated RNA from individual Ehmt2+/+ and Ehmt2−/− E6.25 epiblasts. After complementary DNA (cDNA) preamplification, we measured eRNA expression in these samples. We were able to detect 7/8 eRNAs associated with H3K9me2 marked enhancers, and 4 of these showed significant increase in expression in Ehmt2−/− embryos (Figure 8F). Of all four control eRNAs detected in vivo, none showed altered expression. Taken together, these results reveal that G9a contributes to transcriptional and epigenetic repression of a subset of enhancers. These elements are typically active in naïve pluripotent cells but become repressed during priming of the epiblast. We present here evidence that global H3K9me2 is established by a wave of G9a activity during early postimplantation development and contributes to establishing a crucial chromatin signature at promoters and gene bodies. Once acquired, H3K9me2 represses a specific subset of genes, including key regulators of proliferation and germline development. The enrichment of H3K9me2 additionally extends into domains that contain multiple enhancer elements, leading to their developmentally-linked inactivation. This uncovers an important role for G9a in setting the regulatory circuitry in the epiblast that enables the subsequent developmental programme to unfold. A wave of heterochromatization occurs during early postimplantation development that contributes to the establishment of a specific ‘primed’ epigenetic state in epiblast cells (Borgel et al., 2010; Gilbert et al., 2010). While both G9a and PRC2 are involved in this epigenetic programming process, we found limited overlap between H3K9me2 and H3K27me3 targets or, indeed, between genes that were upregulated in Ezh2−/−and Ehmt2−/− mutant embryos. This indicates that they likely have independent functions, as observed in sESC, which is unrelated to the previously reported G9a-dependent recruitment of PRC2 complex (Lienert et al., 2011; Mozzetta et al., 2013). Thus, prior to gastrulation, H3K9me2 and H3K27me3 generate distinct repressive chromatin states, linked to DNA hyper- and hypomethylation, respectively. These modifications therefore act as complementary systems to target specific regulatory pathways, ensuring that they become repressed during the exit from naïve pluripotency. Following PGC specification, however, there is germline-specific resetting of the epigenome, including the erasure of H3K9me2 and DNA methylation (Hajkova et al., 2002; Seki et al., 2005; 2007), which allows for the expression of germline-specific genes that have been silenced by these epigenetic modifications. We have characterised the epigenetic landscape of the in vivo primed pluripotent cells relative to its in vitro model represented by EpiSCs. It is noteworthy that the two cell types show highly similar distribution of H3K9me2, but EpiSCs globally gain DNA methylation and lose H3K27me3 from germline-related genes, which might contribute to the reduced competence of EpiSCs towards PGCs. Indeed, stable promoter DNA methylation has been previously reported for two germline genes, Stella and Rex1 (Bao et al., 2009; Hayashi and Surani, 2009). Thus we show that in vitro derivation and self-renewal promotes aberrant accumulation of epigenetic modifications, as is the case with sESC and hematopoietic stem cells (Ludwig et al., 2014; Weidner et al., 2013). Our study on a transient and highly dynamic state of the pregastrulation epiblast reveals an unexpected level of epigenetic regulation. It is established that enhancer elements acquire H3K4me1 and H3K27ac coincident with their developmental activation at this point, while others become poised and enriched for H3K27me3 (Buecker et al., 2014; Factor et al., 2014). We additionally reveal that G9a is involved in the rapid switching of epigenetic states at regulatory elements by depositing H3K9me2 (Figure 9). The accumulation of H3K9me2 at enhancers is mostly linked with transcriptional repression, although they transiently retain significant levels of H3K27ac. Thus, we show uncoupling of histone acetylation from the transcriptional state, which indicates that loss of an active epigenetic signature is often secondary to enhancer inactivation. Such contrasting epigenetic marks at enhancers might confer responsiveness and plasticity of cells to signalling cues. This coincides with the rapidly unfolding developmental programme in postimplantation epiblast, resulting in potential for diverse cell fate decisions. In line with this role, the loss of H3K9me2, as seen at an oestrogen-induced enhancer in breast cancer cells, promotes reactivation of the apoptosis regulator bcl2 (Perillo et al., 2008). Proposed model for G9a-mediated enhancer inactivation. Distal regulatory elements active in ICM are typically associated with H3K4me1 and H3K27ac enrichment (green) as well as eRNA expression. Such elements activate promoters (purple) to increase gene transcription. Following implantation, the majority of enhancers undergo inactivation. In many cases, this process is aided by spreading of G9a-dependent H3K9me2 enrichment domains. Despite retaining H3K27ac and H3K4me1 enrichment, these enhancers typically loose eRNA expression. The regulation of enhancer elements likely contributes to the phenotype of G9a null embryos, but is unrelated to increased expression of pluripotency genes, contrary to a previous suggestion (Yamamizu et al., 2012). Decreased proliferation and increased apoptosis is more likely due to de-repression of negative regulators of cell cycle, including a potent cyclin-dependent kinase inhibitor, Cdkn1a (also called p21). Furthermore, G9a preferentially represses three clusters of X-linked genes: Rhox, Xlr and Mage-a. Two of these are imprinted, suggesting a role for H3K9me2 in this process, which merits further investigation (Maclean et al., 2011; Raefski and O'Neill, 2005). Pluripotency is a transient state during mammalian development that is established at the blastocyst stage, and undergoes changes after implantation and development of the epiblast. 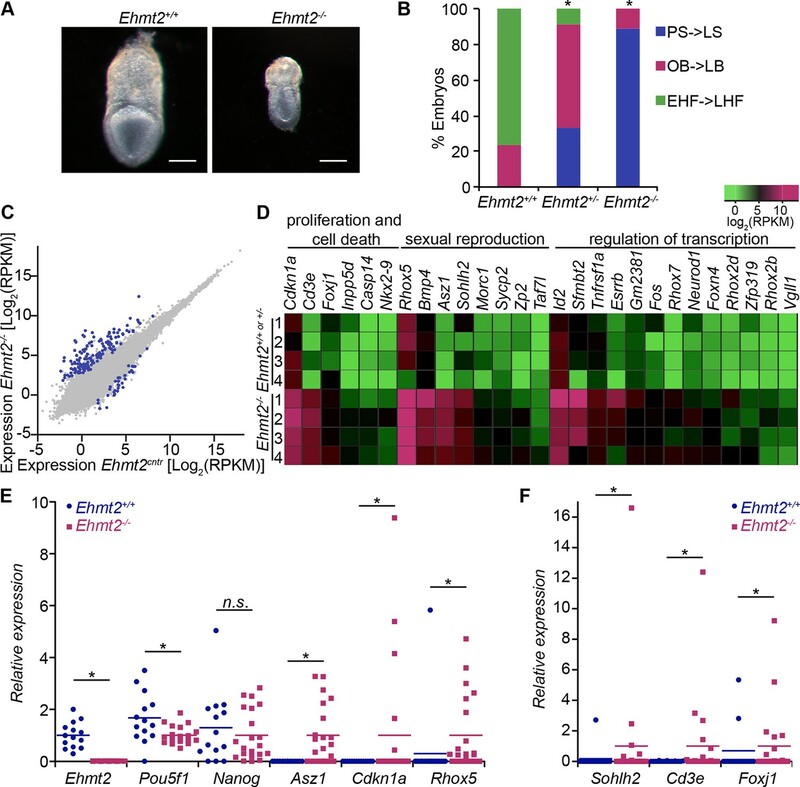 Importantly, G9a-dependent programming entails spreading of H3K9me2 modification to enhancer elements where it regulates their activity; this contributes to rapid and dynamic changes at a critical period of epiblast development prior to gastrulation. Timed natural matings were used for all experiments. Noon of the day when the vaginal plugs of mated females were identified was scored as E0.5. When necessary, postimplantation embryos were staged as previously described (Downs and Davies, 1993). For Ehmt2 matings, a published conditional allele was used (Sampath et al., 2007). Ehmt2+/− mice were next crossed with a ΔPE-Pou5f1-EGFP reporter line (GGOF) (Yeom et al., 1996). This transgene drives enhanced green fluorescent protein (EGFP) expression in preimplantation ICM, and residual fluorescence persists in the epiblast until ~E6.75. For the collection of EZH2-deficient embryos, a previously described allele was used (O'Carroll et al., 2001). All husbandry and experiments involving mice were carried out according to the local ethics committee and were performed in a facility designated by the Home Office. Two male Ehmt2F/− GGOF+ve ESC lines were derived in 2i/LIF conditions as previously described (Nichols et al., 2009). Cells were cultured in N2B27 2i/LIF conditions on gelatine supplemented with 1% knockout serum replacement (Ying et al., 2008). To generate inducible Ehmt2 KO lines, Ehmt2F/− GGOF+ve ESCs were transfected with an expression vector for TAM-inducible CreER by the use of lipofectamine 2000 (Life Technologies, CA). Cre recombination was induced by the addition of TAM. After a 2-day treatment, no Flox G9a allele was detected by genotyping. For ChIP experiments, epiblast cells were isolated from E6.25 pre-gastrulating embryos coming from outbred MF1 females crossed with GGOF stud males. After recovering embryos from the decidua, Reichert’s membrane was dissected out and extraembryonic cone was also removed. Remaining tissue was used to prepare single cell suspension for sorting using MoFlo high-speed cell sorter (Beckman Coulter, CA) based on EGFP expression. The purity of epiblast cells was assessed by staining for SOX2 and was in excess of 95%. For single epiblast experiments, embryos were dissected as previously described (Tesar et al., 2007). Total RNA was extracted using PicoPure RNA isolation Kit (Life Technologies, CA) or AllPrep DNA/RNA Micro Kit (Qiagen, Germany) with an on-column DNaseI digestion (Qiagen, Germany). cDNA was prepared using SuperScript III (Life Technologies, CA) and random hexamer primers (Life Technologies, CA). RT-q PCR reactions were performed using Kapa Sybr Fast qPCR kit (Kapa Biosystems, MA). Single-cell RT-qPCR was performed as previously described, for detailed protocol and reagents refer to the original publication (Tang et al., 2010). For primer sequences see Supplementary file 1. Amplification was performed with QuantStudio 6 Flex Real-Time PCR system (Life Technologies, CA). Dissected Ehmt2+/−× Ehmt2+/− or Ezh2+/−× Ezh2+/−E6.25 epiblasts were lysed and RNA was extracted like for RT-qPCR. Quality and concentration of eluted RNA was assessed with the Agilent RNA 6000 Pico Kit (Agilent Technologies, CA). Only samples with the RNA integrity score >8 were further processed. For Ezh2, three control and three KO samples from three litters were used. For Ehmt2, four controls and four KO from four litters were used. A total of 750 pg of RNA from each sample was amplified using Ovation RNA-seq System V2 (NuGEN Technologies, CA). The quality of cDNA was confirmed by measuring the expression of Ehmt2, Ezh2, Pou5f1 and Nanog by qPCR. For every sample, 1.5 μg of cDNA was sheared to ~230 bp using S220 Focused-ultrasonicator (Covaris, MA). The fragmented cDNA was then concentrated using Qiagen Reaction Cleanup Kit (MinElute). A total of 500 ng of each sample was used as input for library preparation using Encore Rapid DR Multiplex Library System (NuGEN Technologies, CA). Finally, the adaptor-ligated DNA was quantified using KAPA Library Quantification Kit (Kapa Biosystems, MA) and sequenced using HiSeq2000 or HiSeq2500 with single-end 40 or 50 nt read length. RNA-seq reads were all trimmed to 40 nt read length, adapters were removed, and reads were aligned with Tophat2 (Kim et al., 2013) against the mouse reference (GRCm38/mm10) genome. Read counts per ENSEMBL transcript were obtained by HTseq-count (Anders et al., 2014). Transcript annotations were based on ENSEMBL Release 74. Replicates were evaluated, read counts per transcript were normalised, and analysis of differential expression was performed by using the R Bioconductor DESeq package (Anders and Huber, 2010). Normalised read counts were further divided by transcript length (per kB). To account for expression heterogeneity between embryos, the expression in each KO embryo was compared with all control samples. The p-values for each of the three or four comparisons were combined by a Fisher’s combined probability test and set at p<0.05 (Fisher, 1925). To identify biologically relevant results, we set a minimal expression in each replicate of the upregulated sample at Log2(RPKM)>1. Finally, in each comparison, FC in expression had to be at least Log2(FC) >1.4. Published RNA-seq datasets for E3.5 blastocysts were downloaded from the European Nucleotide Archive (ERP005749), reads were trimmed to 40 nt length, and subsequently processed in a similar manner for comparison with E6.25 epiblast using DESeq. RepeatMasker annotations for the mouse reference genome were obtained from the Univeristy of California, Santa Cruz (UCSC) Table Browser. RNA-seq reads were aligned to the mouse reference genome by using bowtie (bowtie-bio.sourceforge.net; version 1.1.0) with parameters ‘-m 1 –v 2 –-best –-strata’ in order to select reads that uniquely map to single repeat copies in the genome only. Read counts for repeat regions were normalised by the total number of RNA-seq reads that aligned to protein-coding genes and by repeat size (in kB). Statistical tests for differential expression of genomic repeat copies were performed by the R Bioconductor DESeq package. GO term enrichment analysis was performed using the DAVID tool (http://david.abcc.ncifcrf.gov, [Huang et al., 2009]). P-values presented were calculated using modified Fisher exact p-value. To summarize relative enrichment of GO terms in H3K9me2- versus H3K27me- marked and repressed genes, we have used ‘revigo’ tool to remove terms with substantial overlapping gene sets (http://revigo.irb.hr, [Supek et al., 2011]). Embryos were dissected from the decidua and Reichert’s membrane and treated as previously described (Nichols et al., 2009). Primary antibodies used are as follows: anti-H3K9me2 (Millipore, CA, 17–648), anti-H3K9me2 (Abcam, UK, ab1220), anti-GFP (Nacalai tesque, Japan, GF090R), anti-G9a (R&D Systems, MN, A8620A), anti-GLP (R&D Systems, MN, PP-B0422-00), anti-cleaved Caspase 3 (Abcam, UK, ab32042), anti-Ki67 (BD Bioscience, NJ, 550609), anti-NANOG (Cosmobio, Japan, REC-RCAB002P-F), anti-AP2γ (Santa Cruz, CA, sc-9877). All imaging was performed using SP5 or SP7 confocal microscope (Leica, Germany). EpiLCs were induced from 2i/LIF ESCs as previously described (Hayashi et al., 2011). For genome-wide studies a X6- EpiSCs (Gillich and Hayashi, 2011) and GGOF ESC lines were used. EpiSCs were grown in feeder-free conditions in fibronectin (Millipore, CA) coated dishes. Culture media contained: N2B27 medium supplemented with bFGF (12 ng/ml) and ActivinA (20 ng/ml). Chromatin was released as previously described (Hackett, et al., 2013). For each ChIP, 107 female day 2 EpiLCs or EpiSCs were used. Immunoprecipitation was performed in dilution buffer (16.7 mM Tris-HCl, pH8, 167 mM NaCl, 1.2 mM ethylenediaminetetraacetic acid [EDTA], 1.1% Triton X-100, 0.01% sodium dodecyl sulfate (SDS), 0.2 mM PMSF, 1 mM dithiothreitol [DTT], 1X Protease Inhibitors) using Protein G Dynabeads (Life Technologies, CA) coated with antibodies specific to H3K27me3 (07–449, Millipore, CA) and H3K9me2 (ab1220, Abcam, UK). For H3K27me3, the ChIP beads were washed three times in ChIP W1 buffer (150 mM NaCl, 10 mM TrisHCl pH 8, 2 mM EDTA, 1% NP40, 1% Na-deoxycholate, 0.2 mM PMSF, 1 mM DTT) and further three washes with increased NP40 concentration to 1.5% (W1.5). For H3K9me2 there were two washes each in low salt (0.1% SDS, 1%, TritonX-100, 2 mM EDTA, 20 mM Tris-HCl, pH 8.1, 150 mM NaCl, 1 mM DTT), high salt (0.1% SDS, 1%, TritonX-100, 2 mM EDTA, 20 mM Tris-HCl, pH 8.1, 300 mM NaCl, 1 mM DTT) and LiCl buffer (0.25 M LiCl, 1% NP40, 1% Na deoxycholate, 1 mM EDTA, 10 mM Tris-HCl pH 8.1, 1 mM DTT). After a final TE (10 mM Tris-HCl pH 8.1, 1 mM EDTA) wash samples were eluted, proteins digested with proteinase K, and DNA purified using phenol/chlorophorm/IAA extraction and further ethanol precipitation. For each experiment, enrichment was confirmed by qPCR for control regions (for primer sequence see Supplementary file 1). Each experiment was performed in biological replicates and 20 ng of immunoprecipitated or input DNA was used for library preparation using Ovation Ultralow DR Multiplex System (0331, NuGEN Technologies, CA). Once prepared, library DNA was resolved on a 2% agarose gel and the mononucleosome (for H3K27me3) and dinucleosome (for H3K9me2) fractions were isolated using MiniElute gel extraction kit (Qiagen, Germany) and sequenced using HiSeq2000 with single-end 40 nt read length. lcChIP-seq was performed by using a modified published method (Ng, et al., 2013). Briefly, EpiSC, EpiLCs or FACS-purified (Fluorescence-activated cell sorting) epiblast cells were fixed in 1% formaldehyde (room temperature, 10 min), quenched with 1 vol. 250 mM glycine (room temperature, 5 min), and rinsed with chilled TBSE buffer (20 mM Tris-HCl, 150 mM NaCl, 1 mM EDTA) twice before freezing in liquid nitrogen. After thawing on ice, fixed cells were pooled (25,000 cells per lcChIP-seq and 50,000 cells per lcChIP-qPCR) and lysed with 100 μl 1% SDS lysis buffer (50 mM Tris-HCl pH8, 10 mM EDTA, 1% SDS, Roche protease inhibitor cocktail; 5mM sodium butyrate on ice, 5 min) and then centrifuged (2000 RPM, 10 min). Samples were resuspended in 100 μl of dilution buffer. Samples were sonicated nine times (30 s pulses with 30 s break interval) using a Bioruptor water bath sonicator (Diagenode, Belgium). Chromatin extracts were then pre-cleared with Protein G Dynabeads and immunoprecipitated overnight with Protein G Dynabeads coupled with antibodies specific to H3K27me3 (07–449, Millipore, CA), H3K9me2 (ab1220, Abcam, UK), H3K27ac (ab4729, Abcam, UK) or normal rabbit serum (Santa Cruz, CA). On the next day, beads were washed for 5 min at 4°C once in each low salt, high salt, LiCl and TE buffer. After elution, samples were digested with proteinase K and reverse crosslinked for 6 hr at 68°C. DNA was purified (phenol-chloroform extraction) and used for qPCR analysis to validate enrichments. Unless otherwise stated, lcChIP-qPCR samples were rescaled by normalizing to +ve control region (H3K9me2: Pcsk5; H3K27me3: Hoxc10; H3K27ac: Gpr20). For lcChIP-seq, isolated DNA was primed using WGA4 kit (Sigma-Aldrich, MO). The next step involved library amplification using HiFi Library Amplification master mix (Kapa biosystems, MA) and BpmI-primer (CCGGCCCTGGAGTGTTGGGTGTGTTTGG). These reactions were incubated in a thermocycler using following conditions: 98°C for 3 min; 11–12× (98°C for 10 s; 65°C for 30 s; 72°C for 1 min); 72°C for 7 min: or 4°C as suggested. The number of cycles depended on the amount of DNA precipitated and so 11 cycles were used for H3K9me2 and 12 for H3K27me3. Amplified DNA was purified with Agencourt RNA clean XP beads. Adapter trimming was performed by BpmI digestion, secondary adaptor ligation, and a second round of digestion (Ng, et al., 2013). Digested DNA was purified with Agencourt RNA clean XP bead and used for library preparation using Ovation Ultralow DR Multiplex System (0331, NuGEN Technologies, CA). Once prepared, library was sequenced using HiSeq2000 with single-end 40 nt read length. 3 × 106 of Ehmt2F/− CreER+ve day 2 EpiLCs were used per experiment. Cells were fixed and frozen as for lcChIP. Similarly, samples were lysed with 1ml lysis buffer. After pelleting the nuclei, they were resuspended in 1 ml dilution buffer and sonicated for lcChIP. Precleared lysates were immunoprecipitated overnight with anti-H3K9me2, anti-H3K27ac, or IgG controls immobilized with Dynabeads Antibody Coupling Kit. After performing six 10 min long washes (2× low salt, 2× high salt, 2× LiCl buffer), complexes were eluted in lysis buffer. Ten percent of each sample was saved for enrichment validation. Remaining samples were diluted ten-fold and used further in lcChIP-qPCR protocol. ChIP-seq reads were extended to a total length of 250 nt for lcChIP, and 150 or 300 nt for H3K27me3 and H3K9me2 nChIP according to selected fragment sizes. Reads were aligned to the mouse reference genome (GRCm38/mm10) using bowtie with parameters ‘–m 1 –v 2’ (Langmead et al., 2009). ChIP-seq intensities on all genomic regions (promoters, gene bodies, enhancer regions and 1kB tiles) were quantified as Log2(normaliseormalized ChIP/input) values. ChIP and input values were obtained as read counts per genomic region divided by total number of mapped reads and divided by the size of the region in kB. UCSC genome browser tracks represent Log2(normalised ChIP/input) on 200 nt-sliding windows with a 50 nt offset. To compare genome-wide distributions of H3K9me2 and H3K27me2 in different cell types, 1kB tiles were calculated for all chromosomes with a 500 bp offset, and each tile was intersected with annotated genomic regions obtained from the UCSC Table Browser. Published ChIP-seq datasets were downloaded from GEO (GSE56138 ES 2i: p300, H3K27ac, H3K4me1, EpiLC: H3K27ac, H3K4me1 plus Activin conditions; GSE57409 EpiSC: H3K27ac, H3K4me1). To determine active enhancers in 2i/LIF ESCs, peaks were called for p300, H3K4me1, and H3K27ac ChIP-seq datasets in ES 2i with MACS (liulab.dfci.harvard.edu/MACS). p300 peaks that intersected with an H3K27ac and H3K4me1 peak, but not with any annotated promoter region were classified as active enhancers. To classify regions as marked by H3K9me2 and H3K27me3, we have used average Log2(normalised ChIP/input) from two biological replicates in all the analysis. Regions were separated into three clusters by k-means method and the most highly enriched was designated as marked. For differential enrichment analysis between EpiSCs and E6.25 epiblast, EdgeR was used (pval<0.05, Log2FC>2) (Nikolayeva and Robinson, 2014). To classify epigenetic signatures of promoters and gene bodies, histone modification (Log2[ChIP/input]) and DNA methylation levels on each genomic region and expression levels of the corresponding genes were represented by n-dimensional feature vectors. Feature vectors were centre-scaled (mean=0, standard deviation=1), and self-organizing maps (SOMs) were trained using the R kohonen() package (Wehrens and Buydens, 2007). After training, each node on the hexagonal map represented a set of promoters or gene bodies with very similar epigenetic signatures and transcriptional states. The figures show the average epigenetic modifications and expression levels for the genomic regions summarized in each node. Neighbouring nodes on the map also contain genomic regions with similar signatures and expression levels as a result of an update function, which adjusts close neighbours with decreasing distance during training. To classify enhancer signatures across different cell types, the same analysis was performed with feature vectors representing histone modifications and DNA methylation levels on enhancer regions (p300 peak summits ± 800 nt) in 2i/LIF ESCs, EpiLC, EpiSC and epiblast. For the representation of sets of enhancers with highly similar signatures as ranked heatmaps, the average values of the epigenetic modifications for the enhancers in each SOM node were determined and ranked by their average H3K9me2 values in EpiLCs or by their average H3K27ac values in EpiSC. Eight hundred and forty-three position-specific weight matrices were determined by high-throughput SELEX sequencing for human and mouse DNA-binding domains (Jolma et al., 2013). Enhancer regions (p300 peak summits ± 800 nt) that were marked by H3K9me2 or H3K27me3 were scanned using fimo (http://meme-suite.org). To evaluate enrichment, 1000 sets of random regions of the same size were generated in gene regions (± 50 kB of flanking intergenic region), and the frequency of DNA-binding motifs was determined using a p-value threshold of 1e-5. DNA was isolated from d2 EpiLC and EpiSC pellets using DNeasy blood and tissue kit (Qiagen, Germany). For every sample, 200 ng was sheared into ~250 bp using S220 Focused ultrasonicator (Covaris, MA). A total of 160 ng of sonicated and purified DNA was used for library preparation using Ovation Ultralow Methyl-Seq Library System (NuGEN Technologies, CA). This entailed a 3.5 h bisulfite conversion of adapter-ligated DNA using EZ DNA Methylation-Direct (Zymo Research, CA). The DNA was amplified using seven cycles. Once libraries were prepared, they were sequenced using HiSeq2000 with paired-end 100 nt read length. Reads were quality trimmed and aligned to the bisulfite-converted genome with Bismark with parameters –n –l 40 (Krueger and Andrews, 2011). Genome-wide DNA methylation levels and differentially methylated regions were determined by using MethPipe (Song et al., 2013). Published WGBS datasets were downloaded from the EBI Read Archive and from GEO (ERR192350) and processed by the same analysis pipeline. Nature Structural & Molecular Biology 16:717–724. Proceedings of the National Academy of Sciences of the United States of America 107:21931–21936. Cold Spring Harbor Symposia on Quantitative Biology 75:143–153. Molecular and Cellular Biology 31:1275–1287. Molecular and Cellular Biology 21:4330–4336. Molecular and Cellular Biology 27:3769–3779. Journal of Embryology and Experimental Morphology 47:39–52. Journal of Statistical Software 21:1–19. Thank you for submitting your work entitled "Chromatin dynamics and the role of G9a in gene regulation and enhancer silencing during early mouse development" for peer review at eLife. Your submission has been favorably evaluated by Fiona Watt (Senior editor) and three reviewers, one of whom is a member of our Board of Reviewing Editors. The three reviewers found your manuscript very interesting. However, there was consensus that currently the manuscript lacks coherence and would greatly benefit from removing parts of the data and strengthening other aspects. Below, I summarize the main discussion points raised during the review process that we would like you to address upon revision. In particular, we suggest that you could consider removing parts from the early embryo due to lack of functional relevance. The reviewers were excited by the ChIP-seq data from epiblast, but felt that additional validations (see comments from Reviewer 2) and analyses (point 4 of Reviewer 3) would maximize the impact of the study. There was also a suggestion to remove the p53 where indirect effects cannot be ruled out. However, it was also discussed that one value of the p53 ChIP result from G9a KO is demonstration that G9a loss enhances p53 binding at select enhancers, without appreciably affecting H3K27ac (Figure 6D). The reviewers suspect that this may be an indirect consequence of either increased accessibility at enhancers associated with loss of H3K9me2 (which would be an interesting phenotype supporting role of G9a in enhancer repression) or simply of an increased cellular stress resulting in increase in p53 stability (perhaps less interesting). If combined with some accessibility data and eRNA expression analysis at matching enhancers (none of the enhancers at which eRNAs were analysed corresponds to the p53-bound enhancers from Figure 6D), the p53 ChIP result could be used to strengthen the conclusions on the role of G9a in regulating enhancer function – which currently needs further work. We also highly encourage you to further strengthen the computational analysis and specificities required. This should help in addressing a number of points raised by the three reviewers. In the current study, Zylicz and colleagues explore the role of G9a and EZH2 during early embryonic development encompassing the 2-cell stage and early blastocysts. The quantity and technical aspects of this study are very impressive. Each of the experiments provides important insights into the function of G9a and EZH2 in priming gene regulatory networks in epiblast cells. However, the experiments are disjointed and do not flow together well to make one coherent story. There is sufficient data here to produce two or more coherent stories exploring individual early findings reported by the authors. For instance, data from the 2-cell study and the transposons experiments can be removed to improve the flow of the paper as they detract from the main message of the study. 1) The H3K9me2 expression levels in Figure 1C, compared to GLP and G9a expression levels in Figure 1–figure supplement 1 are standardized to different time points. In addition, different time points are presented (i.e. E3.5 versus E4.5; E5.5 versus E6.5). Is this the reason that expression of H3K9me2 and G9a/GLP does not directly correlate? The authors should standardize the expression to the same stage if they wish to draw comparisons. 2) It is not clear why the samples from the G9a M/Z and M/+ are pooled in the analysis presented in Figure 1E and Figure 1-figure supplement 2E? In other panels the data is separated. Transcription of some genes from the zygotic genome has been reported as early as the 2 cell stage and hence, these data should be separated. This may also reduce the large variation seen in Figure 1E and Figure 1–figure supplement 2E. 3) During the RNA seq. analysis, why was a fold change cut-off of log2(1.6) used? Furthermore, was a false discovery rate, which is more commonly used, applied to the data? How can the authors rule out that all direct targets of G9a are changed by at least log2(1.6)? 4) In the G9a-/- versus control RNA seq., G9a mRNA does not appear to be reduced (Figure 2–source data 1). Is there a reason for this discrepancy? 5) What was the cut-off for significance in the Ezh2-/- RNA Seq. dataset? It is not clear in the paper. Is it the same as the G9a-/- RNA Seq? The authors need to make this information clear. 6) Figure 3E shows only a small number of transcriptional changes despite H3K27me3 and H3K9me2 being wide spread. Does the correlation change if the arbitrary log2 cut-off of 1.6 is changed? Deletion of chromatin modifying proteins does not always result in very large changes in the expression of target genes. 7) The authors need to further address the discrepancy in OCT4 level between their study and Yamamizu et al., 2012. It seems odd that there is such a large incongruity between the two studies. Only one line is provided in the Discussion on this topic and it does not sufficiently propose any reasons for such discrepancy. Given that lack of changes in pluripotency is central to the conclusions of this paper, the authors should undertake staining for OCT4 in G9a-/-embryos and controls. 8) The authors show in Figure 2E that p21 is upregulated in a subset of G9a-/-samples, which is consistent with increased H3K9me2 at the p21 locus during ESC differentiation. The authors claim that these observations support their view that the delayed development of G9a-/- embryos is related to increased apoptosis and/or reduced proliferation, and not retainment of pluripotency. The authors have provided little evidence for this. The authors should validate their proposal in vivo by undertaking BrdU incorporation studies and phospho-H3 staining for proliferation, as well as TUNEL or active caspase-3 staining to analyse cell death. 9) In addition, can the authors exclude that the expressions of important developmental genes are normal at E6.5? For instance, a very high level of Bmp4 is observed in G9a-/- E6.25 epiblasts (Figure 2D), which could be one explanation for developmental defects. In situ hybridizations for developmentally important genes including Bmp4 need be carried out. 10) In the E6.25 RNA Seq. data (Figure 2–source data 1), p21 mRNA is not reduced in G9a-/- epiblasts. Can the authors explain its absence? 11) Since the authors state that a significant proportion of genes affected by G9a deletion are involved in germ line specification, the authors need to show whether germ cells are affected. Are PRDM14 and Blimp1 expression patterns normal in G9a-/- embryos? If pluripotency is indeed unaffected, while germ line specification is presumably impaired, can the authors show normal alkaline phosphatase staining in G9a-/- embryos and not in germ cells? 12) The authors claim that 2i ESCs as primitive ectoderm (PrE). In contrast, the works from Austin Smith's lab and others (Van Oosten et al., 2012 for example) have shown that the ESC state in 2i resembles the naïve state of the epiblast. Why do the authors consider the 2i state to be similar to the PrE? Rather, ESCs in standard ESC medium (with serum) are considered to be more like E4.5 PrE. Please note that I cannot judge the stringency of the bioinformatics pipelines used in depth, and therefore my comments are focused mostly on the biology of the questions addressed and the conclusions drawn, rather than in the stringency of the computational side. I do find, in general, that the computational data is not always presented in a manner for a broad readership, and some points below suggest improvements towards this direction. Although a few of the observations documented are not particularly new, the manuscript by Zylics and colleagues builds on former data on Ezh2 and G9a in regulating development around implantation. The strongest point in, my view, is the analysis of epiblast cells in vivo at the transcriptional level and at the chromatin level (K9me2 and K27me3) genome wide. The experiments are carefully executed and in most instances the conclusions drawn are supported by the data presented. I have, however, mixed feelings about the presentation and the flow of the manuscript. It does not come out as a single, solid message, and is diluted with many pieces of data, some of which I find irrelevant for the main conclusions and I would therefore suggest to remove these parts, which encompass all the pre-implantation data (which is not strong enough), as well as the p53 data at the end, which in the end are not very strong. This would allow the authors to concentrate in a less dense manner, on the main messages of the paper based on the transitions between naïve/primed and epics states. I have some comments on the ChIP protocol validation that require in my view, additional experimental work, and some comments to draw to the phrasing and statistics throughout the manuscript, as well as clarification or additional computational analysis. The 'pregastrulation conclusion’ (paragraph four of the Discussion) is reasonable, but the preimplantation work is confusing, and poorly documented in comparison with the peri-implantation and in vitro data (e.g. statement of 2C specific gene regulation by G9a is based on only 3 genes) and does not add much to the manuscript and instead deviates the focus of attention from the pre-gastrulation cell fate transitions. All figures lack description of quantification of fluorescence intensities, as well as the N numbers for IF and quantifications. The only description is 'fluorescence intensity was normalised to DAPI', but the authors state that they used 'quantitative immunofluroescence' to analyse levels. Please add a better description and/or controls for this. In Figure 3B and C: Why is ChIP enrichment mostly negative – it suggests rather a depletion of mark? Is there any enrichment at all e.g. for K9me2 in Figure 3B? The same applies for Figure 3–figure supplement 2 C, in which H3k9me2 'enrichment' is again below 0. From Figure 3B and 3D, the authors conclude that K9me2 and K27me3 are on different regions. However, the data presented do not fully support these conclusions, both from analysis in 3B and from the self-organising maps: while there are some regions that are not overlapping, there are clearly other regions that do show overlap. The shape of the line in the fitting in 3B also suggests this interpretation. Since this analysis was not presented with statistics, nor with a comparison of e.g. active promoters or full genome data for 3B, I believe that the authors are not in the position to conclude what they conclude, so this part needs reinterpretation. Regarding my validation point above, the only validation presented for the lcChip-seq is a comparison of Pearson figures (Figure 3–figure supplement 1) based on clustering of independent replicates – what if replicates are all poor showing similar background enrichment? The protocol would need validation to assess a comparison in magnitude of enrichment to standard protocol. I assume the authors have some material left to run a couple of PCR reactions, can they estimate by ChIP-PCR the differences in order of magnitude with the lcChIP in EpiSC versus the 'normal' EpiSC ChIP protocol? I do not see much significance/added value on the p53 data (in the subsection “G9a Mediates Efficient Enhancer Inactivation”), and it only adds more 'density' in the manuscript, which is quite dense. Specially, how relevant (biologically and statistically) is the "15%" of H3K9me2 and H3K27ac enhancers being bound by p53? The analysis of 'proximity' of eRNA is not presented adequately, nor it is known what 'proximity' is? In kb? This cannot be inferred from the graphs presented. Can the authors do an enrichment analysis of eRNA expression (on the y axis) relative to specific distances of genes (on the x axis, in kb). The conclusion on page 15 on H3K9me2 domains 'extend to active enhancers targeted for silencing, which accounts for coenrichment with H3K27ac' implies a causal relationship for which there is no data. In this study Zylicz et al. set out to explore the deposition and function of repressive histone marks such as H3K27me3 and H3K9me2 during early embryonic development. The authors generated embryos deficient for G9a or Ezh2 methyltransferases and examined their gene expression profile using single epiblast RNA-seq at day E6.25, prior to the overt phenotypic manifestations. To determine which genomic loci are marked by repressive histone methylation marks in vivo, the authors performed low cell number ChIP-seq assays for H3K27me3 and H3K9me2 in E6.25 epiblasts. Strikingly, for either mark, an exceedingly small subset of marked genes is perturbed upon loss of respective enzyme, suggesting either existence of multiple redundant silencing mechanisms or these methylation events being a secondary consequence of repression. Furthermore, the set of genes that are aberrantly upregulated are non-overlapping between the two different knock outs and show therefore that in the epiblast H3K27me3 and H3K9me2 are involved in repression of different set of genes. The authors note that many intergenic enhancer regions are marked by H3K9me2 in the epiblast, and they follow up upon these observations using the in vitro cellular models. They conclude that G9a mediates efficient inactivation of a subset of enhancers, particularly those bound by p53. This study contains many interesting observations, tackles an important biological question and is generally well-executed. However, it also suffers from weaknesses that dampen my overall enthusiasm, but which could be fairly easily addressed. 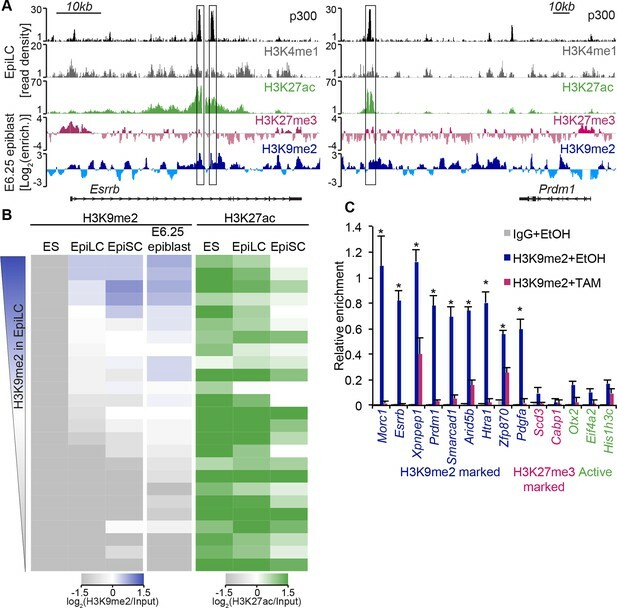 In Figure 4E, heatmaps of H3K9me2 from ESC (to show that these loci indeed gain H3K9me2 during differentiation) and 6.5 epiblasts (to show that similar findings can be observed in vivo) should be included. Furthermore, how would these heatmaps look if authors chose as their analysed regions enhancers that are active in EpiLC/EpiSC, but not in ESC? What would be the corresponding profiles (if any) of H3k9me2 status at these regions? 2) A substantial weakness of the study is that despite the authors having all the necessary reagents in hand, the data pertaining to the functional impact of G9a on enhancer activity is limited to just a few examples, and not coherent ones either (e.g. enhancers shown in Figure 6D don't overlap those shown in Figure 6G-F). Given that the role of G9a in enhancer inactivation is one of the central novel claims of the paper, at the very least the eRNA expression analysis from the G9aF/–CreER EpiLCs treated with EtOH or TAM should be done systematically, across all H3K9me2 marked enhancers, and in comparison to enhancers unmarked by H3K9me2, but containing similar enrichment levels of H3K27ac. The relationship between enhancers with G9a-dependent eRNA expression and transcriptional changes at neighboring genes should be determined. To what extent transcriptional changes observed in G9a KO cells can be explained by H3K9me2/eRNA changes at nearby enhancers? 3) Increased p53 binding upon loss of G9a may be an indirect consequence of the defect in enhancer repression, perhaps resulting in the increased enhancer accessibility- did the authors consider looking at chromatin accessibility measurements such as ATAC, DNase or FAIRE? Such data could in fact strengthen the conclusions on the functional impact of G9a on enhancer activity, regardless of the specific impact on p53. 4) The authors generate valuable H3K9me2 and H3K27me3 ChIP-seq datasets from epiblast cells of E6.25 embryos, but I feel they missed the opportunity to provide a deeper comparison of their results with the H3K9me2 and H3K27me3 patterns reported from the in vitro cellular models such as EpiLC or EpiSC. What are the major similarities and differences in patterns? A systematic (and to whatever extent possible, quantitative) comparison of H3K9me2 patterns across the genome in different cellular states would not only be broadly interesting for the community, but also relevant for the authors' own conclusions. To address this point, we have removed all observations on the effects of G9a mutation on preimplantation embryos, and focused on the transition from naïve to primed pluripotency. We also performed additional experiments on the link between p53 and G9a. Since we found an increase of activated phopho-p53 globally in cells lacking G9a (see Author response image 1), we cannot determine the effects of H3K9me2 on recruitment of p53 to enhancers. Accordingly and in response to Reviewer #2, we have removed the p53-related analysis from the paper. Western Blot of d2 G9aF/- CreER+ve EpiLCs treated with ethanol (EtOH) or tamoxifen (TAM). 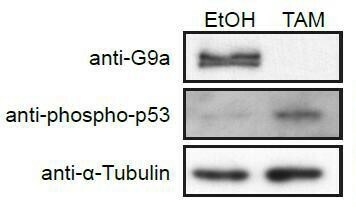 Membranes were probed with anti-G9a, anti-phopho-p53 and anti-aTubuline antibodies. As suggested by the reviewers, we have included additional bioinformatics analysis for detailed comparison between in vitro EpiSCs and in vivo epiblast (Figure 4 and Figure 4–figure supplements 1 and 2). We have also added whole-genome bisulfite sequencing dataset performed on EpiSC, which reveals substantial DNA hypermethylation compared to the epiblast. To increase the depth of analysis, we have incorporated published RNAseq analysis of E3.5 ICM (Boroviak et al., 2014), which has enabled analysis of ChIPseq data in the context of developmental progression (Figure 3D-F, Figure 3–figure supplement 3A). In response to the reviewers’ suggestion, we have expanded our analysis of in vivo IF, which convincingly shows accumulation of H3K9me2, GLP and G9a upon implantation (Figure 1 B-G). We also reveal an increase in the number of apoptotic and non-proliferative cells as judged by cleaved caspase 3 and Ki67 staining (Figure–figure supplement 2C, D). Indeed we agree and removed this part. The reviewers were excited by the ChIP-seq data from epiblast, but felt that additional validations (see comments from Reviewer 2) and analyses (point 5 of Reviewer 3) would maximize the impact of the study. Detailed comparison between EpiSCs and in vivo epiblast including WGBSeq dataset (Figure 4, Figure 4–figure supplement 1). Analysis of ChIPseq in the context of exit from naïve pluripotency by incorporating published E3.5 RNAseq datasets (Figure 3D-G, Figure 3–figure supplement 3). Inclusion of an epiblast sample into the enhancer analysis (Figure 6 B) as well as extension of such analysis to EpiLC/EpiSC active enhancers (Figure 6–figure supplement 1). The additional analysis shows that EpiSCs accumulate aberrant DNA methylation and loose H3K27me3 from germline genes, which might limit their competence for germline fate. By including published E3.5 ICM dataset, we are able to identify differentially expressed genes during the exit from naïve pluripotency. In this context we reveal that H3K27me3 and H3K9me2 target specific pathways independently. Finally, accumulation of H3K9me2 in EpiLCs enhancers is also seen in the in vivo epiblast. We show that loss of G9a in EpiLCs leads to increased activation of p53 globally as judged by western blot for phopho-p53 (Author response image 1), resulting in increased p53 stability upon loss of G9a. For this reason, we have removed the data on the recruitment of p53 to G9a bound enhancers as it is most likely an indirect effect. The enhancer experimental part now shows a consistent panel of 13 enhancers that were analysed with respect to eRNA expression dynamics. We show H3K9me2 accumulation, H3K27ac enrichment, sequential ChIPqPCR and eRNA misexpression in G9a mutant cells in vitro and in vivo. The strength of this comprehensive analysis is that it looks directly at the epigenetic and transcriptional state of enhancers rather than relying on a possible erroneous assumption that enhancers regulate the nearest genes. Nevertheless, we extracted the expression of nearby genes from E6.25 epiblasts and can confirm that 3/8 genes in proximity of H3K9me2 marked enhancers are indeed upregulated (Author response image 2). However, we prefer not to include this analysis in the publication, as we are not able to reliably link the enhancers to specific genes. Bar plot showing changes in expression levels of genes nearest to analysed enhancers in G9acntrand G9a-/- E6.25 epiblast. We thank the reviewer for the supportive comments. We have now removed both preimplantation experiments as well as p53 ChIP. Instead we concentrate on in-depth analysis of H3K9me2 and H3K27me3 during the transition from naïve to primed pluripotent cells. We have now removed most of the data on preimplantation IF staining and instead concentrated on two crucial stages (E3.5 and E5.5), which is now part of updated Figure 1. Original inconsistencies occurred because different antibodies showed excessive background staining in the visceral endoderm. To circumvent this problem, we had to remove visceral endoderm at E5.5 for staining with anit-G9a antibodies. 2) It is not clear why the samples from the G9a M/Z and M/+ are pooled in the analysis presented in Figure 1E and Figure 1–figure supplement 2E? In other panels the data is separated. Transcription of some genes from the zygotic genome has been reported as early as the 2 cell stage and hence, these data should be separated. This may also reduce the large variation seen in Figure 1E and Figure 1–figure supplement 2E. We have decided to remove all observations on preimplantation G9a mutants from this manuscript. In this experiment, we used a low input protocol for single epiblast RNAseq. There is some biological variability between the control embryos as well as between KO embryos. We take that into account by using pairwise comparison between individual epiblasts to make sure that a minimum threshold is met in all control vs KO comparisons. Indeed, setting thresholds is to some extent arbitrary but is commonly used in transcriptional analysis. In Figure 3 of the Response document, we show estimated rate of false positives in relation to the threshold used. This rate has been estimated based on the biological and technical variability observed between control samples. At a Log2(1.4) the ratio of identified genes versus false positives reaches 0.01. The same threshold has been set for both G9a and Ezh2 RNAseq experiments. G9a is also called Ehmt2, which is cited in the source data file and is indeed significantly down-regulated. To avoid confusion, we have now updated the name of the gene to Ehmt2 in the whole manuscript. We now make it clear in the text that the parameters used were identical to those for G9a RNAseq (paragraph three, subsection “Epigenetic Programming Regulates Growth and Development of the Embryo”). Indeed it is true that small transcriptional changes are also possible. Such effects however are confounded by the variability between control epiblasts and technical variability introduced by using a low input RNAseq protocol. Hence we are unable to rigorously estimate and identify such transcripts. In Author response image 3 we show the number of genes identified in relation to the cut-off. At the lower end of the threshold the false discovery rate however is too large. Plot showing background (expected) and observed number of transcripts reaching specific fold change (FC) deregulation thresholds. Expected values were estimated based on variability of gene expression between G9acntr or Ezh2cntr RNAseq samples. Observed dataset are genes reaching FC threshold in G9a-/- or Ezh2-/- RNAseq samples. The ration of observed vs expected reaches 0.01 value only at log2(FC)>1.4. 7) The authors need to further address the discrepancy in OCT4 level between their study and Yamamizu et al., 2012. It seems odd that there is such a large incongruity between the two studies. Only one line is provided in the Discussion on this topic and it does not sufficiently propose any reasons for such discrepancy. Given that lack of changes in pluripotency is central to the conclusions of this paper, the authors should undertake staining for OCT4 in G9a-/- embryos and controls. We agree with the reviewer that IF would be relevant. We now show that GFP signal from Oct4-GFP does not show any significant differences between G9acntr and KO epiblasts (Figure 2–figure supplement 2B). More importantly we focused on NANOG, which at E6.5 is already substantially down-regulated in the anterior epiblast (Osorno et al., 2012). Our whole-mount staining revealed comparable levels of NANOG in G9aKO and G9acntr epiblast (Figure 2–figure supplement 2 A). In Figure 2–figure supplement 1 (C, D) we now show whole-mount IF staining against cleaved caspase 3 and Ki67. By carefully quantifying IF signal from 5 G9a+/+ and 5 G9a-/- embryos we confirm increased rate of apoptosis in E6.5 mutant embryos. Indeed we also observed increased numbers of non-proliferative Ki67+ve cells. This indicates that loss of G9a results in increased apoptosis and reduced proliferation. In this study we show that loss of G9a leads to developmental delay, reduced proliferation and increased apoptosis. We report that there is no delay in the exit from pluripotency but there is upregulation of multiple developmentally relevant genes as well as some repeat elements. We have added observations on Nanog and Oct4-GFP, which remain unchanged in mutant embryos. Unfortunately while it is not possible to validate all RNAseq findings, we have however undertaken the task of doing so for some germline and proliferation genes (Figure 2 E, F). A potential increase in Bmp4 could contribute to the phenotype, but it is perhaps equally or more likely that epigenetic changes associated with the enhancers and promoters have important consequences for changes in gene expression. In our opinion, in situ hybridizations would not provide further insights on the relative contributions of signalling and cell autonomous changes to the phenotype. This aspect however is beyond the scope of this study. 10) In the E6.25 RNA Seq. data (Figure 2—source data 1), p21 mRNA is not reduced in G9a-/- epiblasts. Can the authors explain its absence? p21 is also called Cdkn1a it is under this name in the source data file and is indeed significantly up-regulated. We have updated the name for Cdkn1a in the whole manuscript. Here we show that loss of G9a results in upregulation of multiple late germline cell fate regulators. However RNAseq experiments showed no difference with respect to Prdm14 or Blimp1. Based on this observation, we posit that germline specification will remain unaffected. To address this issue, we collected severely delayed G9a-/- ΔPE-Oct4-GFP+ve E8.5 embryos. Whole-mount staining clearly showed a small population of GFP+ve and AP2g+ve putative PGCs at the base of allantois (Figure 2–figure supplement 2 A). The numbers of PGCs were however reduced in the mutants, probably because of their severe developmental delay. Thus, loss of G9a is compatible with germline specification despite premature expression of late germline markers. A recent study from Austin Smith’s lab shows that 2i/LIF ESC might be more similar to primitive ectoderm of E4.5 embryos (Boroviak, 2014). However there is no direct genome-wide comparison between 2i/LIF ESCs, and different in vivo stages. Since there is also a lack of rigorous terminology in the field, we have decided to consistently use the most frequently used term: ICM (inner cell mass). […] I have, however, mixed feelings about the presentation and the flow of the manuscript, which does not come out as a single, solid message, and is diluted with many pieces of data, some of which I find irrelevant for the main conclusions and I would therefore suggest to remove these parts, which encompass all the pre-implantation data (which is not strong enough), as well as the p53 data at the end, which in the end are not very strong. This would allow the authors to concentrate in a less dense manner, on the main messages of the paper based on the transitions between naïve/primed and epics states. We thank the reviewer for a positive feedback about the quality of work presented and its interest for a broad readership. We have addressed a number of issues to make the manuscript more coherent. In particular, we have removed the work on preimplantation G9a mutant embryos as well as the p53-related work, and concentrated our attention on the transition between naïve and primed pluripotency in vivo. In this respect we have included an analysis of E3.5 ICM RNAseq. This allowed us to identify specific pathways repressed upon implantation and the epigenetic mechanisms involved in this process. We now show that regulators of metabolism and transcription are preferentially targeted for H3K27me3 accumulation. On the other hand H3K9me2 is linked to regulators of meiosis. We also provide comparison between in vivo epiblast and EpiSCs on the epigenetic level. This revealed substantial accumulation of DNA methylation in EpiSCs especially at germline related promoters, concomitantly with the loss of H3K27me3. This observation is consistent with the diminished competence of EpiSCs for PGC fate. We have decided to remove all work on preimplantation G9a mutants from this manuscript. This is now addressed in the revised manuscript. Every IF experiment was performed in at least 3 biological replicates, which is clearly stated in figure legends, including the numbers of embryos analysed, and how the signal was measured. For Figure 1 E-G, signal from individual ICM/Epiblast nuclei was measured and normalised to the intensity of DAPI signal. Such measurements were done on individual z-stacks in at least 3 embryos and 20 cells per developmental stage. We agree with the reviewer that this scale might be misleading. However, H3K9me2 does not form peaks but rather occupies large domains of enrichment where gene bodies and promoters are generally depleted of the mark compared to intragenic regions. Thus all elements reaching log2(ChIP/input)>0 are actually significantly enriched when compared to all genic regions as they reach levels typical for silent intergenic regions. (This data is now presented in Figure 3A and C). We have strengthened this result further by providing additional statistical analysis, and described this in the text (in the subsection “H3K9me2 and H3K27me3 are Associated with Distinct Repressive Chromatin States in vivo”). Classification of all promoters reveals that only ~0.3% show dual H3K9me2 and H3K27me3 marking. This result is consistent with a high level of anti-correlation that is statistically significant with p-value of 0.0024 (Chi2 test). We have also performed an analysis of H3K9me2 vs H3K27me3 at all promoters (Author response image 4). However we do not include it in the manuscript as addition of active genes provides a population of H3K9me2-negative and H3K27me3-negative regions, it is thus impossible to plot a correlation curve. Density contour plots showing correlation between H3K27me3 and H3K9me2 enrichments at all promoters in E6.25 epiblast. In line with the reviewer’s comment we have now included a direct comparison of enrichments at control regions achieved using standard and low cell number ChIP protocol (Figure 3–figure supplement 1A). This analysis shows only slightly reduced fold enrichment for H3K27me3 ChIPqPCR and no such effect for H3K9me2. This confirms that the low input method is suitable for genome-wide analysis. We can confirm that a significant proportion of H3K9me2 enriched enhancers are also enriched for p53. However we have also found that loss of G9a leads to global activation of the p53 pathway. Thus increased recruitment of p53 to enhancers in G9a-/- cells is most likely an indirect effect. We decided to remove this part, and instead focus on the transition from naïve to primed pluripotency in vivo. The analysis of 'proximity' of eRNA is not presented adequately, nor it is known what 'proximity' is? In kb? This cannot be inferred from the graphs presented. Can the authors do an enrichment analysis of eRNA expression (on the y axis) relative to specific distances of genes (on the x axis, in kb). We have now updated this information, which is now in Figure 8C. We include the distance of the enhancer to nearest gene’s transcriptional start site. However we have seen no correlation between the expression of eRNA and distance to the nearest gene and thus decided not to include it in the manuscript. The conclusion on page 15 on H3K9me2 domains 'extend to active enhancers targeted for silencing, which accounts for coenrichment with H3K27ac' implies a causal relationship for which there is no data. Indeed H3K9me2 accumulation does not seem to be actively targeted to specific loci, but rather extends to regions silenced or undergoing repression. However, in our view this phrase does not imply causal relationship. 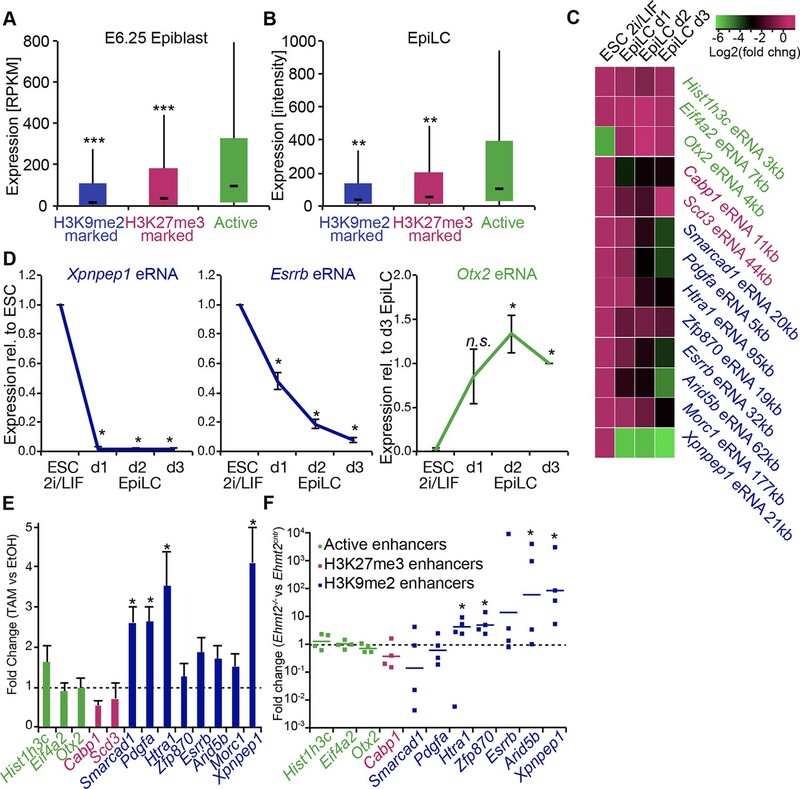 In Figure 4E, heatmaps of H3K9me2 from ESC (to show that these loci indeed gain H3K9me2 during differentiation) and 6.5 epiblasts (to show that similar findings can be observed in vivo) should be included. (This data is now presented in Figure 6 B). To address this question, we performed a more in-depth analysis of enhancer dynamics between different cell types. We have classified all active ESC enhancers based on the H3K27ac/H3K9me2 status in ESC/EpiLC/EpiSC and clustered similar elements together (Figure 6 B). This heatmap now includes ESC samples and shows striking gain of H3K9me2 in primed cells. Moreover H3K9me2-marked enhancers show loss of H3K27ac in EpiSC. Finally we have included E6.25 epiblast sample to show that the same enhancers gain H3K9me2 in vivo. Furthermore, how would these heatmaps look if authors chose as their analysed regions enhancers that are active in EpiLC/EpiSC, but not in ESC? What would be the corresponding profiles (if any) of H3k9me2 status at these regions? This point is directly addressed in Figure 6–figure supplement 1 C. Again we have clustered enhancers but as suggested by the reviewer we have included regions active in EpiLC and EpiSC. Next we sorted the clusters based on the H3K27ac level in EpiSC. This showed that highly active enhancers in EpiSC are devoid of H3K9me2. This result confirms that H3K9me2 is excluded from active enhancer in self-renewing cells. We have now removed all p53 bound enhancers from the analysis as their increased activation might be linked to indirect p53 stabilisation. Therefore, measuring eRNA expression at these loci would not be informative for this. The enhancer analysis now shows a consistent panel of 13 regions that were analysed with respect to eRNA expression dynamics, H3K9me2 accumulation, H3K27ac enrichment, sequential ChIPqPCR and eRNA misexpression in G9a mutant cells in vitro and in vivo. The strength of this comprehensive analysis is that it looks directly at the epigenetic and transcriptional state of enhancers rather than relying on a potentially erroneous assumption that enhancers regulate the nearest genes. Nevertheless, we have extracted the expression of nearby genes from RNAseq on E6.25 epiblasts and can confirm that 3/8 genes in proximity of H3K9me2 marked enhancers are indeed upregulated in G9a-/- embryos (Author response image 2). However, we have not included this analysis in the paper as we are not able to reliably link enhancers with specific genes. Finally, assessing the expression of nearby genes is further confounded by the fact that they themselves might be targets of H3K9me2 at promoters or gene bodies. We have now found that increased recruitment of p53 to enhancers is most likely due to activation of this pathway upon loss of G9a. Nevertheless we performed DNAseI-qPCR hypersensitivity assay to address potential increased accessibility of the loci (Author response image 5). However we did not observe changes at enhancers with increased eRNA expression in G9aKO EpiLCs. This result is in line with a lack of change to the H3K27ac at these loci (Figure 7 D). This further indicates that there is some level of uncoupling between enhancer activity and its accessibility during the dynamic process of inactivation. Bar plot showing DNAseI hypersensitivity of selected enhancers in d2 G9aF/- CreER+ve EpiLCs treated with ethanol and tamoxifen. Shown is average from two independent biological repeats (+/- StDev). We have now included an in-depth comparison between the epiblast in vivo and EpiSC in vitro (Figure 4 and Figure 4—figure supplement 1). This includes the results from lcChIPseq for H3K9me2 and H3K27me3 modifications as well as WGBSeq dataset. Both cell types have strikingly similar distribution of H3K9me2 showing that accumulation of this modification occurs rapidly and efficiently both in vivo an in vitro. On the other hand, there is substantial redistribution of H3K27me3 during EpiSC derivation including loss of this modification from multiple promoters of germline regulators. We also show that self-renewing EpiSCs accumulate substantial levels of DNA methylation especially at regions where the polycomb mark is lost. This explains, at least in part, reduced developmental potential of EpiSCs for the germline fate due to stable epigenetic silencing of PGC genes. We are grateful to Alexander Tarakhovsky and Dónal O'Carroll for sharing G9a conditional knockout mice. We thank Jenny Nichols for critical input into the project and members of the Surani Lab for helpful discussions. We also thank Charles Bradshaw for bioinformatic support. Animal experimentation: All husbandry and experiments involving mice were authorized by a UK Home Office Project License 80/2637 and carried out in a Home Office-designated facility. © 2015, Zylicz et al. Jan J Zylicz et al. Early mouse development is regulated and accompanied by dynamic changes in chromatin modifications, including G9a-mediated histone H3 lysine 9 dimethylation (H3K9me2). Previously, we provided insights into its role in post-implantation development (Zylicz et al., 2015). Here we explore the impact of depleting the maternally inherited G9a in oocytes on development shortly after fertilisation. We show that G9a accumulates typically at 4 to 8 cell stage to promote timely repression of a subset of 4 cell stage-specific genes. Loss of maternal inheritance of G9a disrupts the gene regulatory network resulting in developmental delay and destabilisation of inner cell mass lineages by the late blastocyst stage. Our results indicate a vital role of this maternally inherited epigenetic regulator in creating conducive conditions for developmental progression and on cell fate choices.